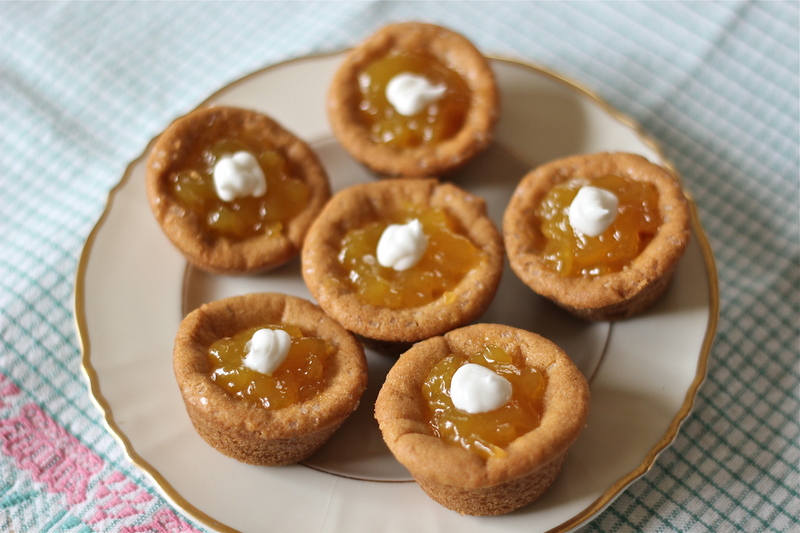 A “tassie” is a small cup-shaped cookie or tart, and comes from the Scottish word tass + ie. which means small cup. Taking this idea to its simplest form I made the lemon tassies from supplies that I had on hand. 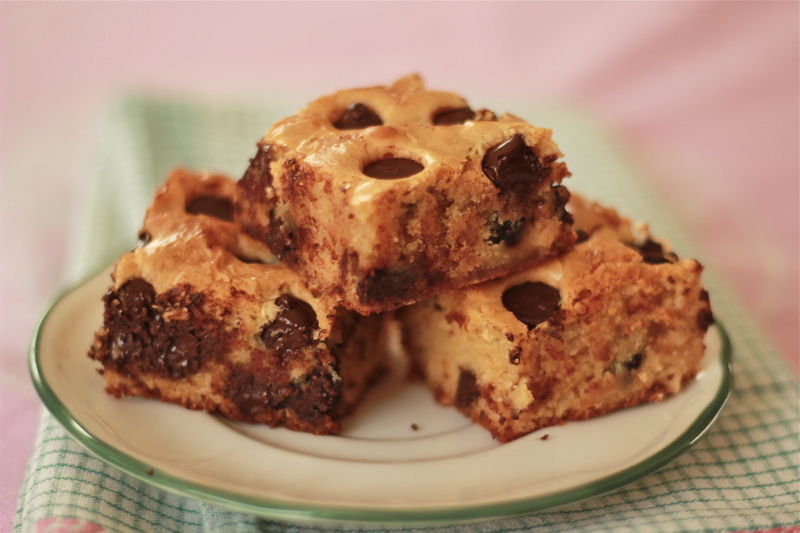 They were extremely easy to make and insanely good to eat. I started with a package of refrigerated sugar cookie dough, the kind that comes in a block and can be separated into 24 “squares”, one for each cookie. 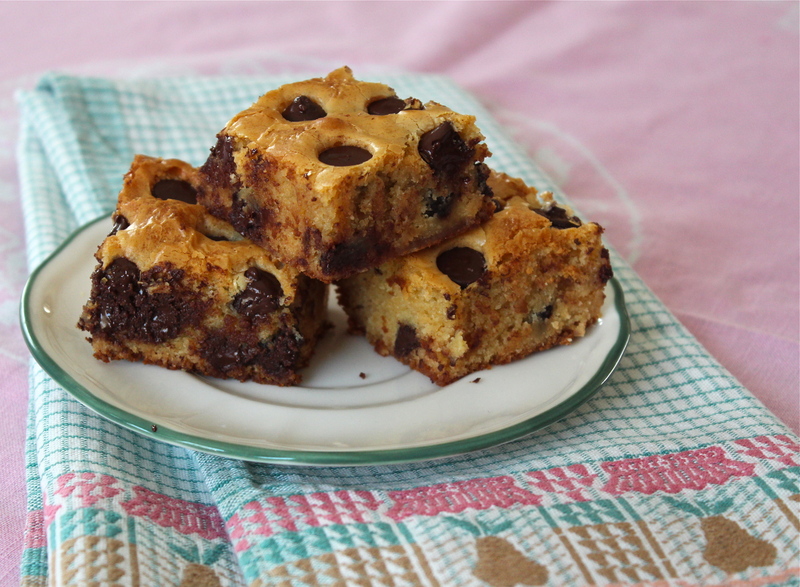 Using two mini-muffin pans, I placed a block of cookie dough into each well, and with my fingers pressed it to cover the bottom, and up the sides of the muffin cups. Then I baked them. 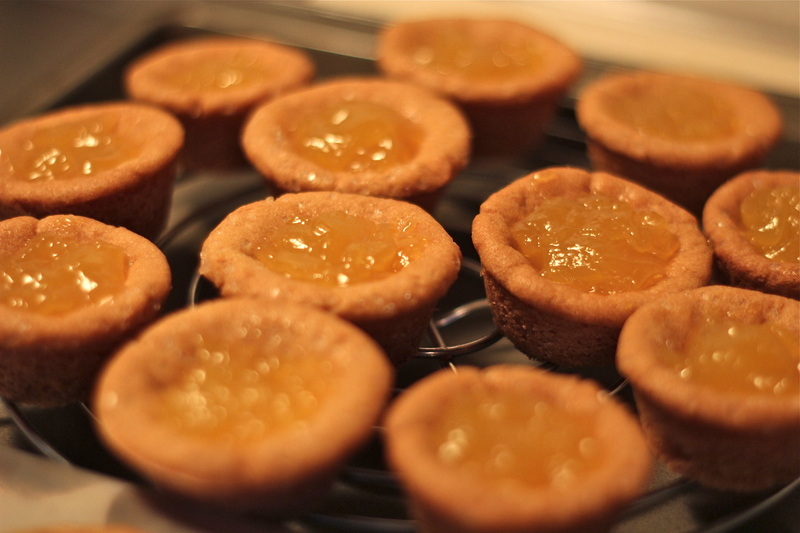 After baking, there was a depression in the center of each one where I spooned about 1 teaspoon of lemon curd. 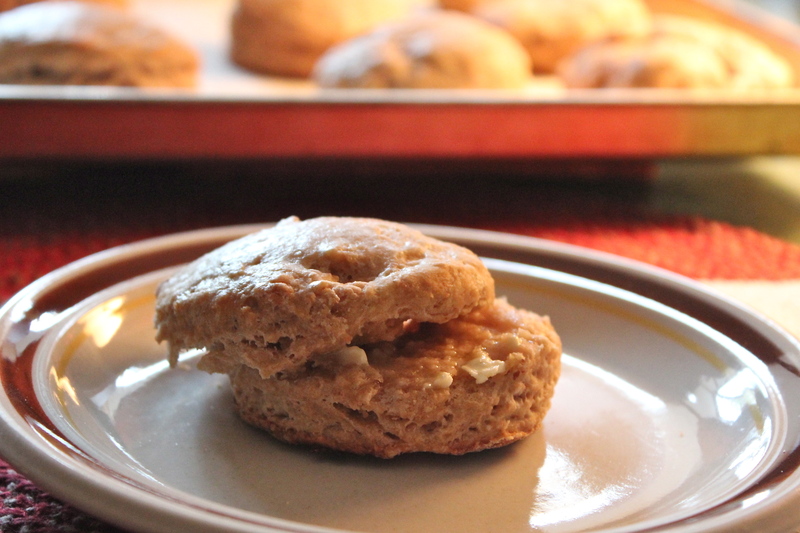 The heat from the still warm cookies, softened the curd so that it spread and filled the depression. After they were completely cool, I put a dab of white frosting on each one. (Frosting was left over from a previous baking project.) If I didn’t already have the frosting, I would have dusted them with confectioners’ sugar, because I thought they needed something white on them for garnish. For a special occasion a candied flower, like a violet, would be a lovely garnish. When first made the cookie part was crisp, but I kept them in a covered container, and the next day the cookie had softened and become chewy. 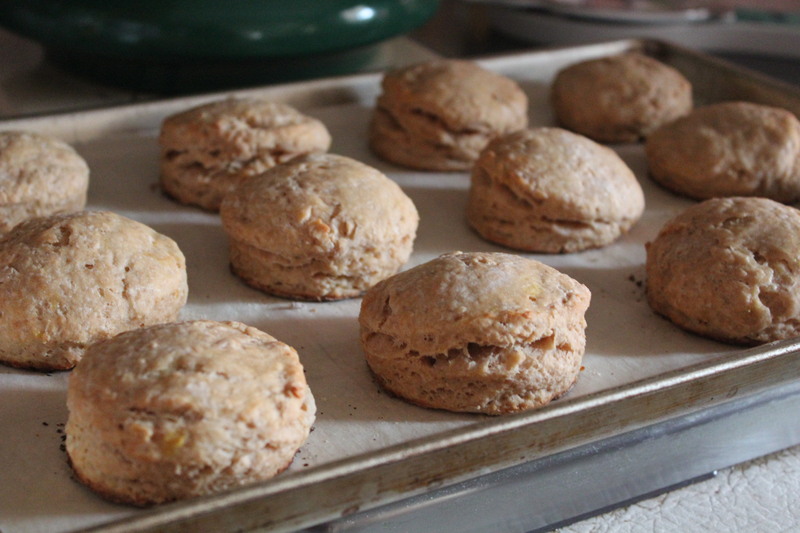 That seemed to fit the smooth, lemony filling better and we liked them better that way. For some reason I always seem to want something lemon in spring time, and I already had a small amount of lemon curd that I had made, so that’s how I came up with this idea. 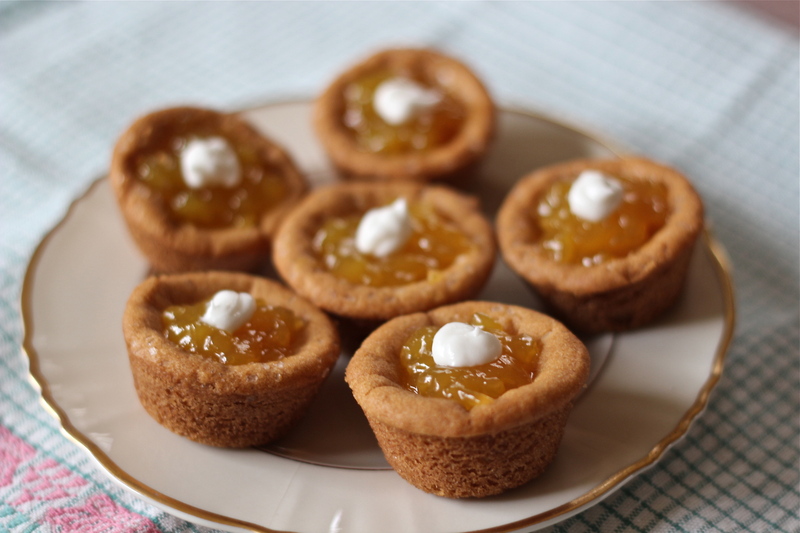 I think these little finger cookies ( or tarts) would be great served at a tea, a Mother’s Day Brunch, a shower, or any other springtime occasion. 1 package of preformed , refrigerated sugar cookie dough, 24/pkg. Spray the muffin cups with non-stick spray. Preheat the oven as the cookie package suggests. Place one block of cookie dough in each of the muffin cups; with your fingers press to cover the bottom and up the sides to form a shell. 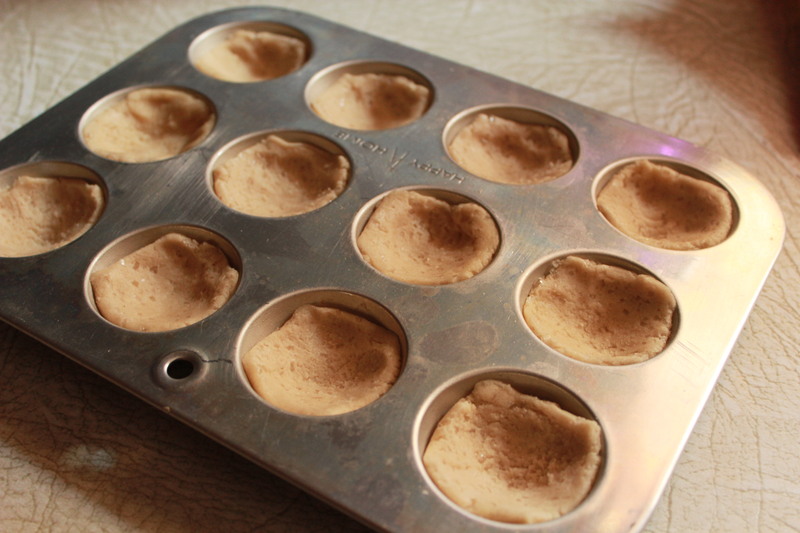 Press dough into the wells of a mini-muffin pan. Bake for the recommended time on the cookie package, starting to check on them early, so they don’t get too brown. 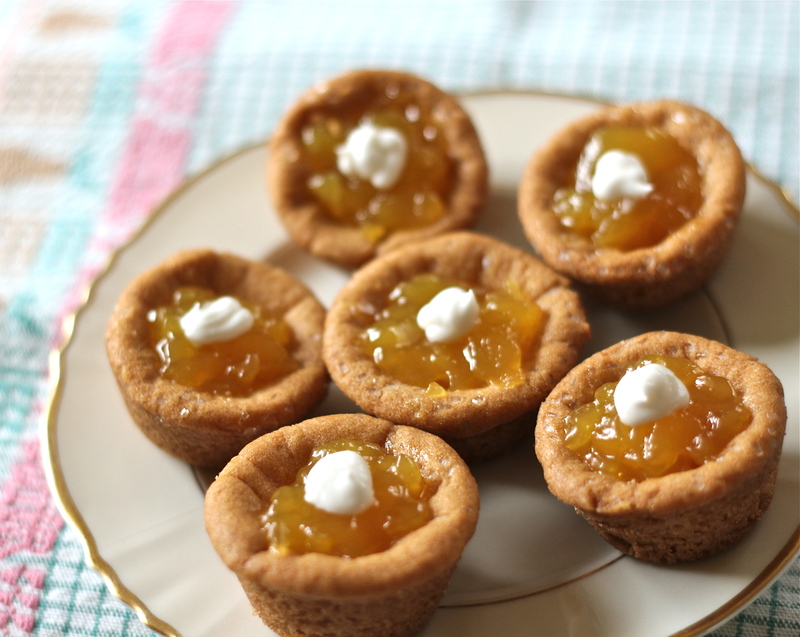 Remove from the oven, and while still warm, spoon about 1 teaspoon of the lemon curd into the depression of each cookie. After baking the shells, fill depressions with lemon curd. 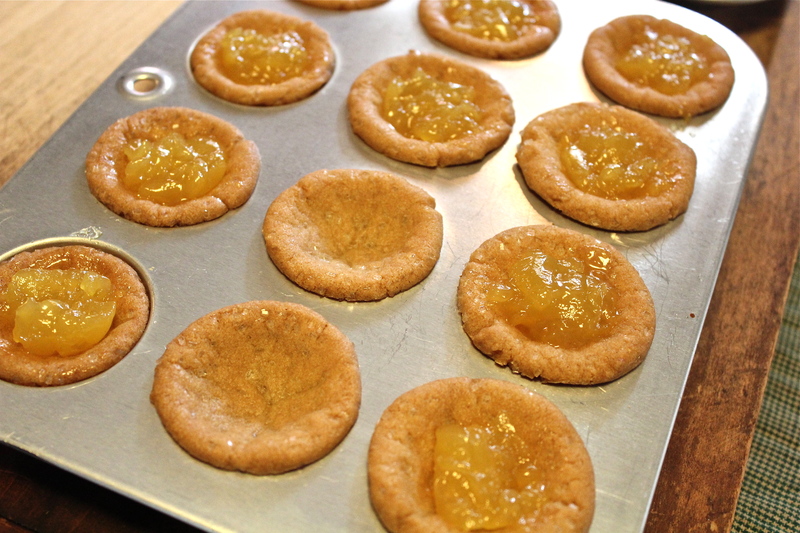 Allow to cool completely on a wire rack, loosening the cookies so they don’t stick. Garnish the top of each cookie with your choice of frosting or other decorative garnish. **If lemon curd is not available, any flavor of jam would be a nice substitute. 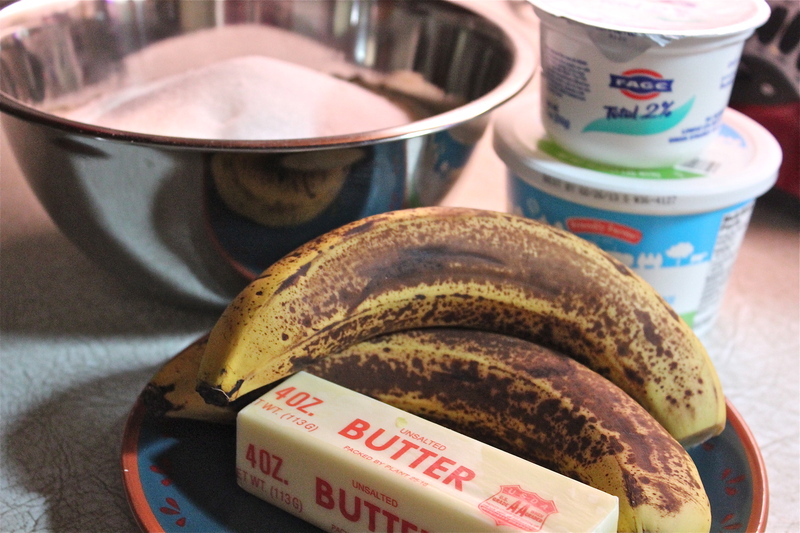 Did you ever think of making your breakfast before going to bed ? No? Me, either. But then I got this idea from something I read. So simple, really, why haven’t I thought of this before now? The whole idea is to use your crock pot or slow cooker to cook breakfast overnight and when you get up in the morning, instead of starting then to cook cereal, voila, there it is hot and waiting for you. Hot and waiting for you in the morning. 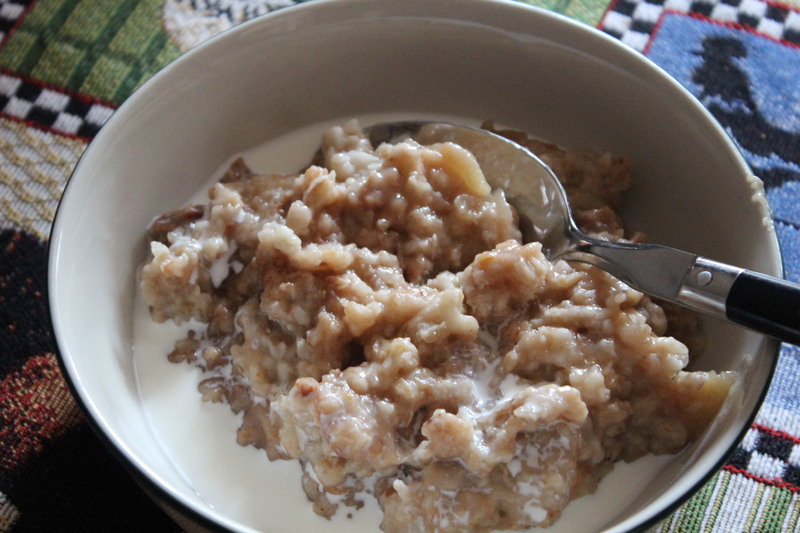 On the weekends I often will cook steel-cut oats for hot oatmeal which we both love, but it usually takes about 20 minutes of cooking time. So of course, I never make it on weekdays. 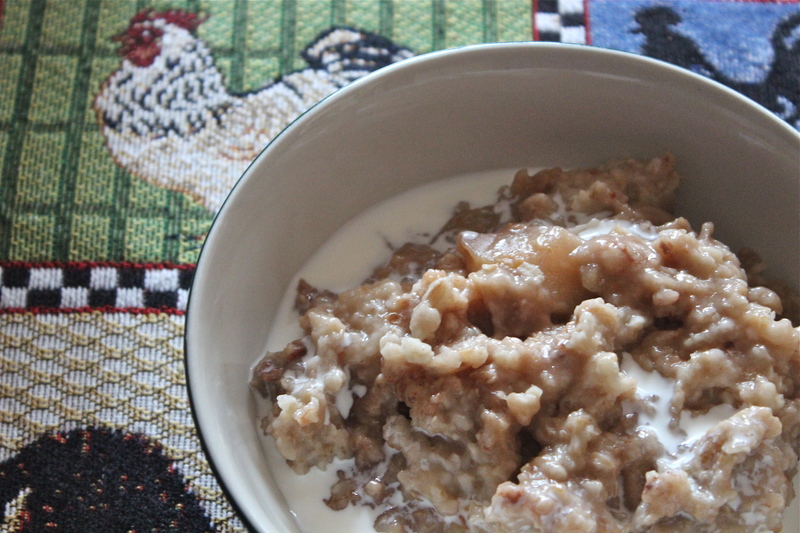 But with starting it in the crockpot the night before, we can now have oatmeal anytime we want. 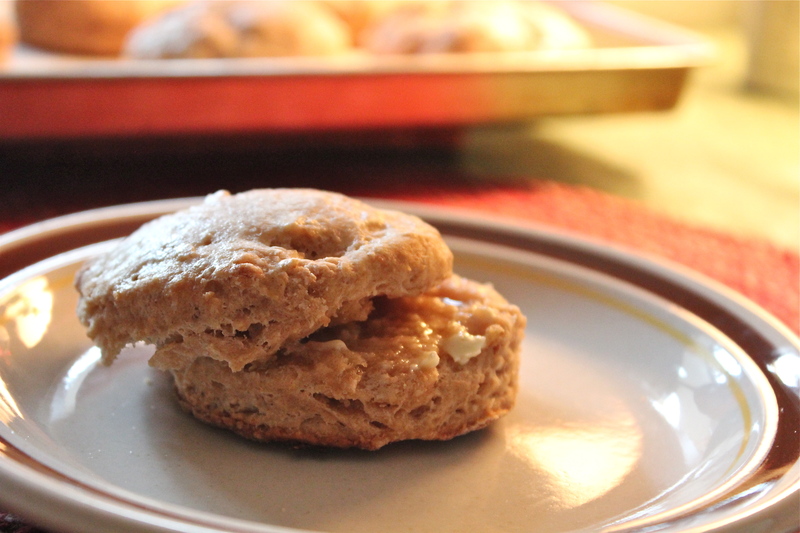 And the recipe makes about 6 servings, so once made, I refrigerate the extra, and can warm up just one serving in the microwave very easily whenever I want. I am so proud of myself for coming up with this. When I told my daughter about it she said, “yeah, I know, I’ve done that before.” Duh! Where have I been? 1. Peel and slice 2 apples and put in the bottom of a crockpot, sprinkle 1/3 cup brown sugar, and 1 teaspoon cinnamon over the apples. 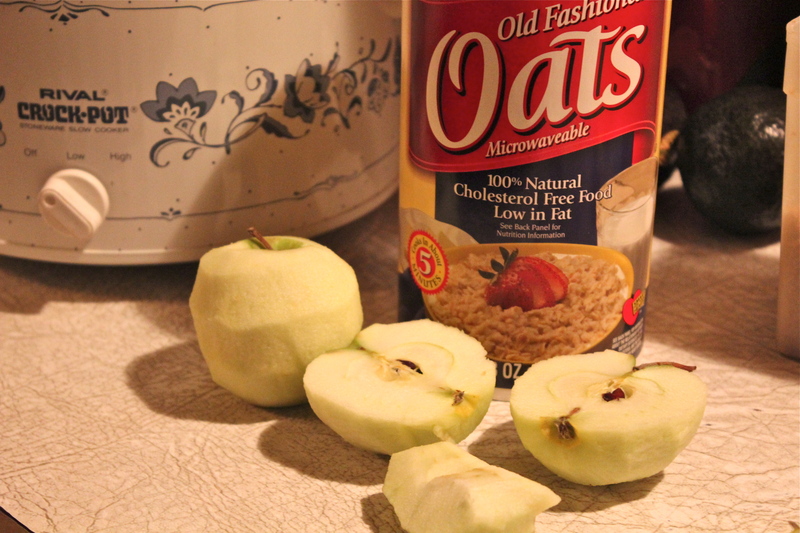 If you are not fond of apples in oatmeal use raisins, or just leave out the fruit completely. 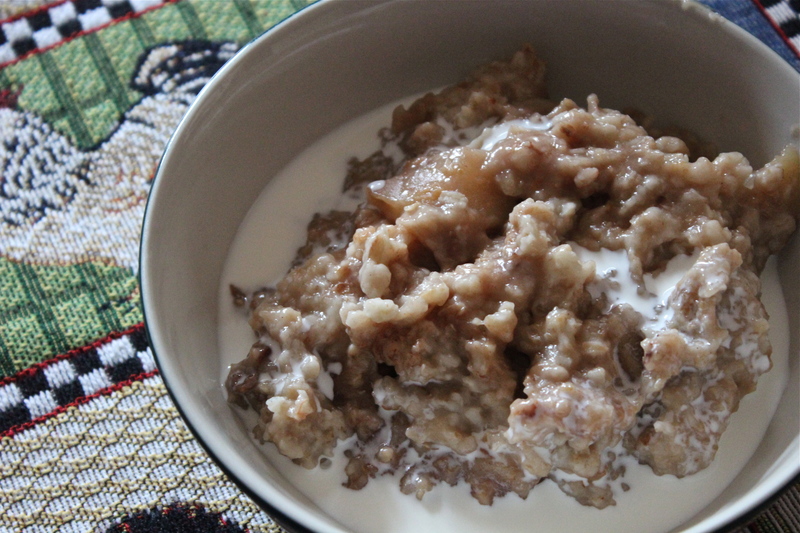 Apples, brown sugar, cinnamon and oatmeal. What’s not to like. 2. 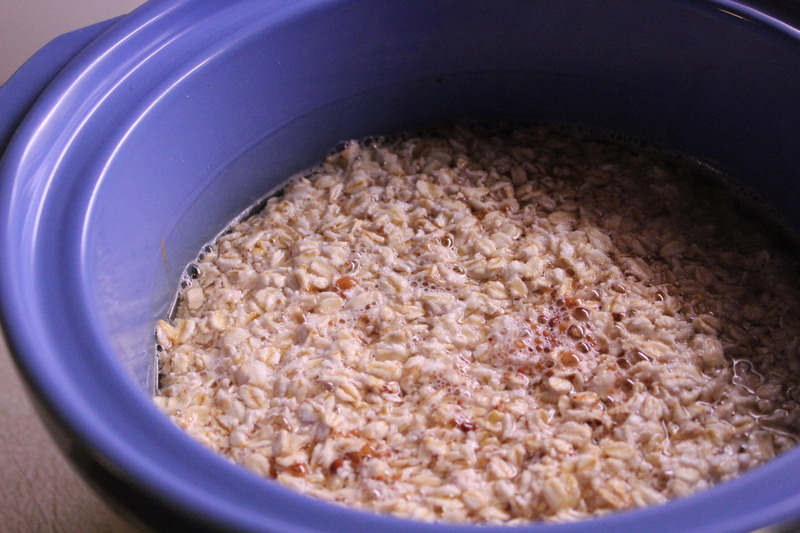 Pour 2 cups regular or steel-cut oats on top, then add 4 cups water. Do not stir! 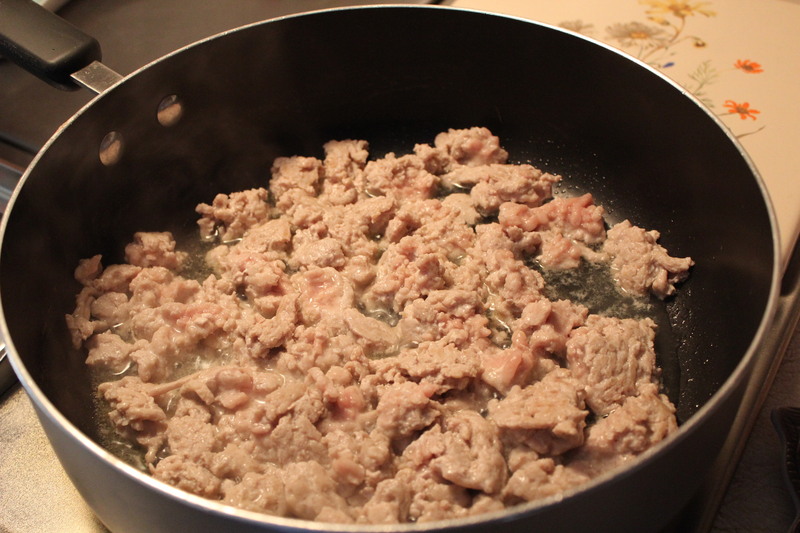 Cook overnight 8 – 9 hours on low. 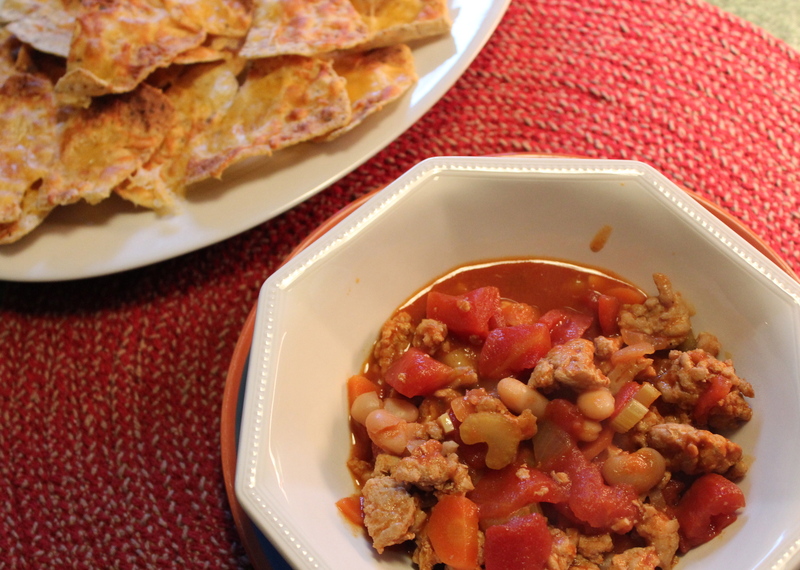 Layer it all in the crock pot, set it to low, and forget it. 3. Before serving give the pot a stir to mix it all up and enjoy with milk or cream poured over the top. YUM! A hot breakfast waiting for you. 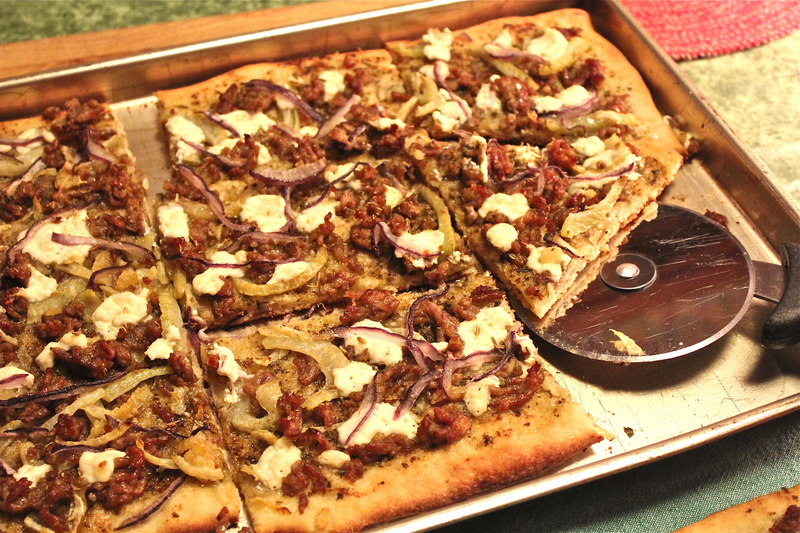 Sausage, fennel and ricotta pizza. 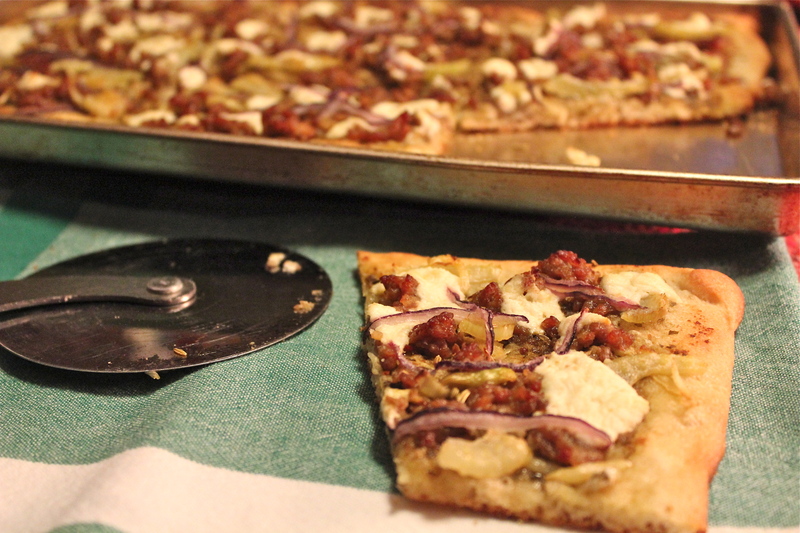 Friday evenings feel like pizza night to me. Not always, but quite frequently I make it for dinner. When you make it often you need a variety of toppings to fall back on- at least I do. As I have said previously, variety is the spice of my life. I get bored easily with the repetition of the same foods, and pizza is one of those foods that lends itself to whatever you may have on hand to put on it. Last week’s version ended up with a crazy combination of things, that somehow worked together, and became an instant favorite. I’m writing this down so that I don’t forget it. It started with a roll of refrigerated pizza dough from the supermarket. This was my first time using this particular product. I usually use a ball of dough from the bakery department. The pizza dough was very easy to use. 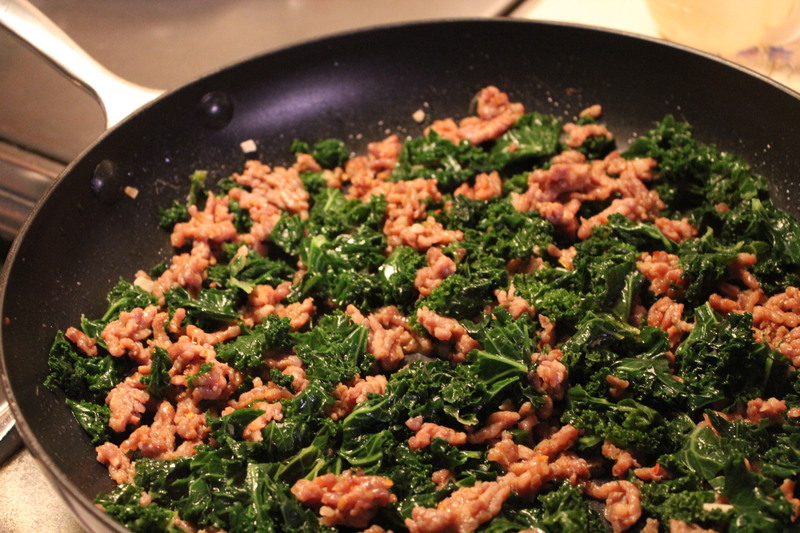 Just unroll it onto your pan and with your fingers press it out to fit. Make it thick or thin; however you like it. 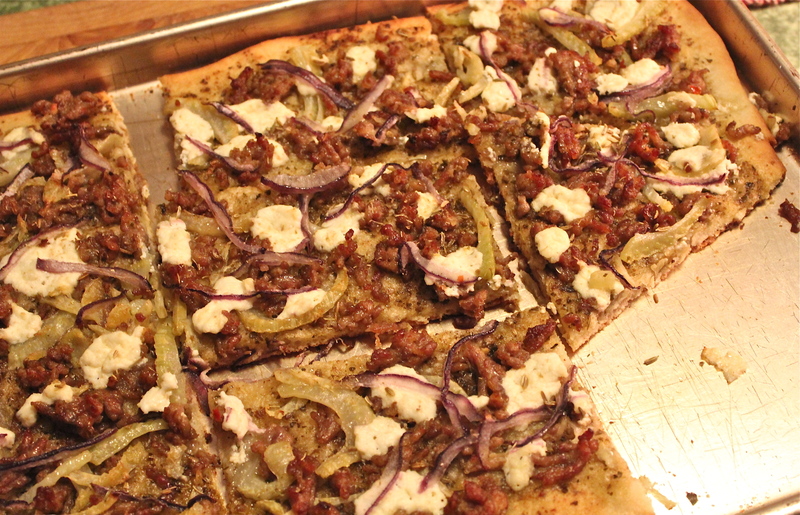 The toppings consisted of half pound of sausage meat, half a fennel bulb, thinly sliced, some sliced red onion, and ricotta cheese to which I added some Italian herbs and minced garlic. A pizza like this could be vegetarian by omitting the sausage and adding in some other vegetables like broccoli, and/or peppers. 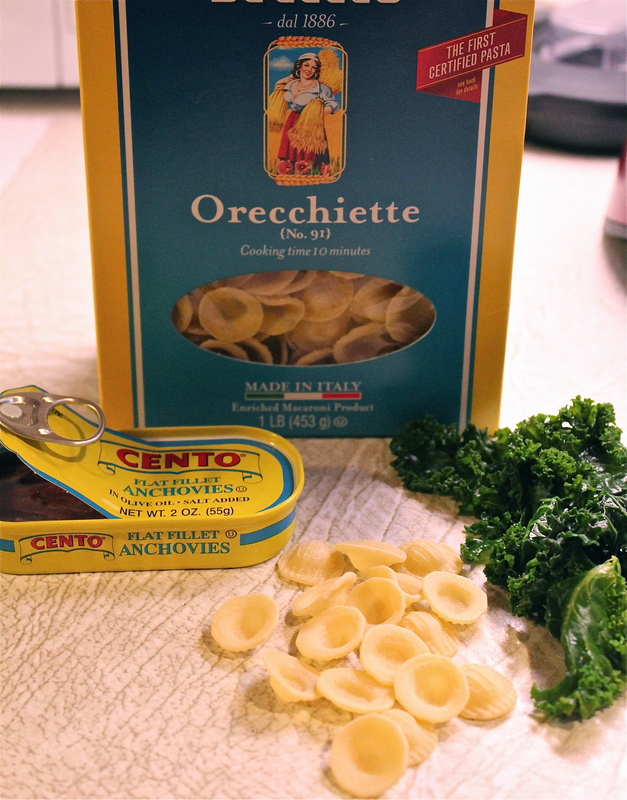 In place of the fennel, you might use baby spinach. 1. Remove pizza dough from refrigerator and bring to room temperature while oven preheats. Preheat oven to 450*F. Lightly grease a pizza pan, baking sheet, or pizza stone. Sprinkle cornmeal evenly on baking pan or stone. 2. Heat a large nonstick skillet over medium-high heat. Remove casings form sausage. 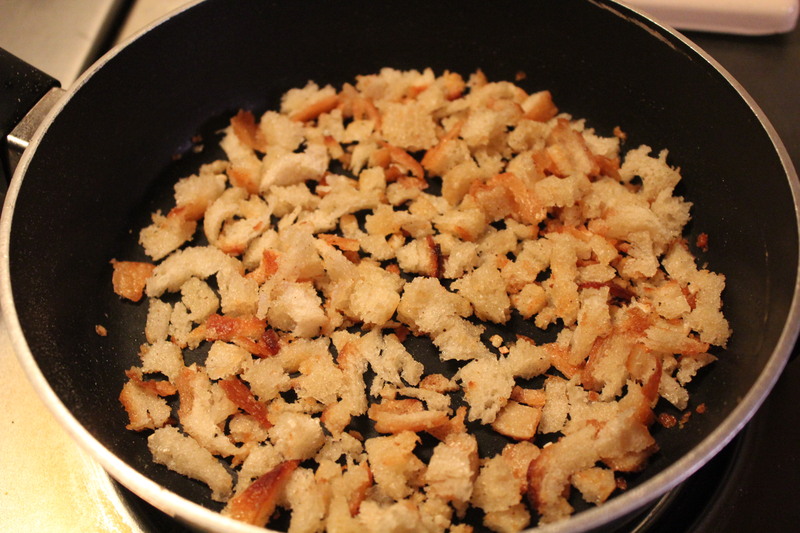 Crumble and add to pan, cook 4 minutes or until lightly browned. Add fennel bulb; cook 4 minutes or until tender. 3. Roll pizza dough into a 16 – inch oval and place on baking sheet, or press into the pan with your fingers. 4. Brush the dough evenly with the pesto. Sprinkle the sausage mixture evenly over the dough. Combine ricotta with the minced garlic and Italian seasoning in a small bowl; top pizza with teaspoonfuls of ricotta mixture. 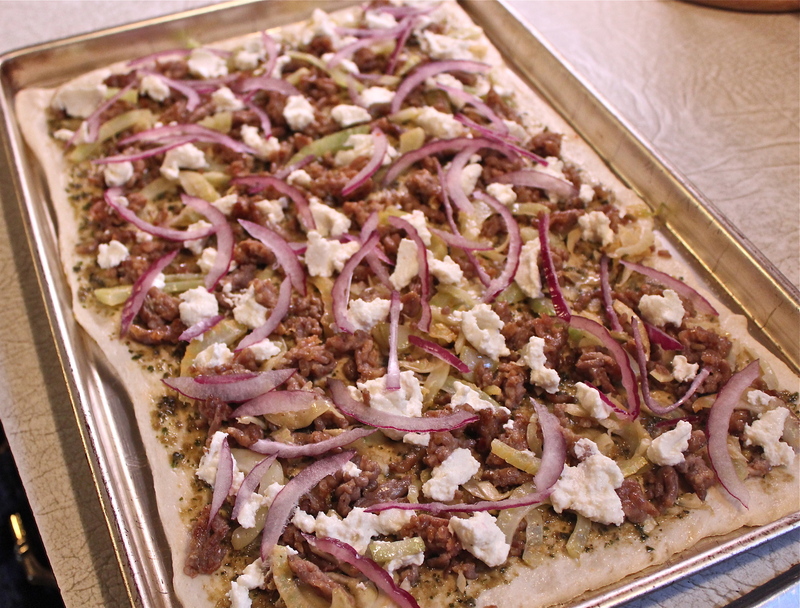 Sprinkle red onion and remaining ingredients evenly over pizza. Layer on all the ingredients. 5. 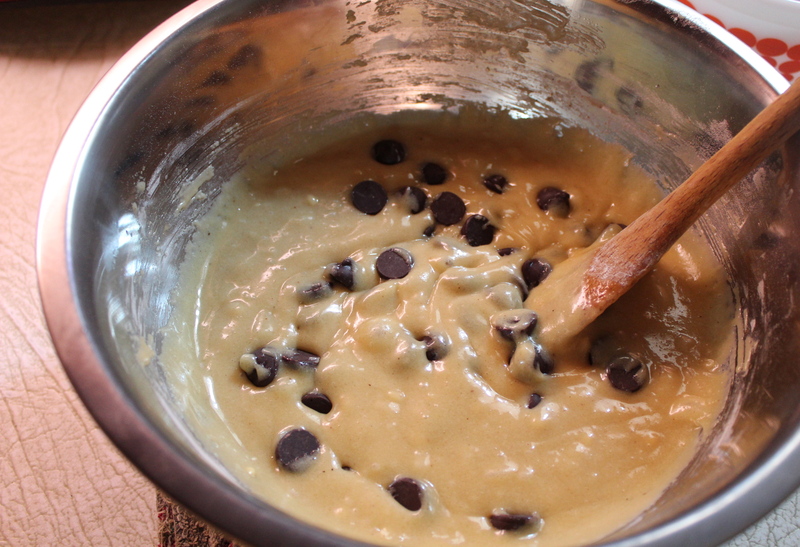 Bake at 450*F for 10 – 11 minutes or until golden. Cut into 8 slices. In my version, the crust was thin and crispy. Served with a hearty salad this made a very filling meal. This recipe is a take off on the favorite appetizer Buffalo Chicken Wings. It contains all the same ingredients, but in different form. 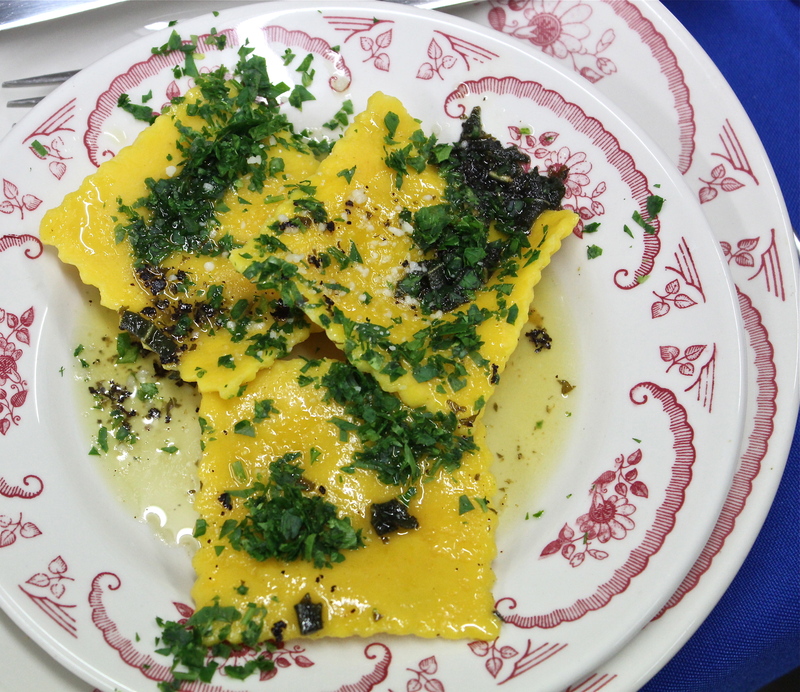 I’ve made this dish several times now and each time we seem to enjoy it more and more. 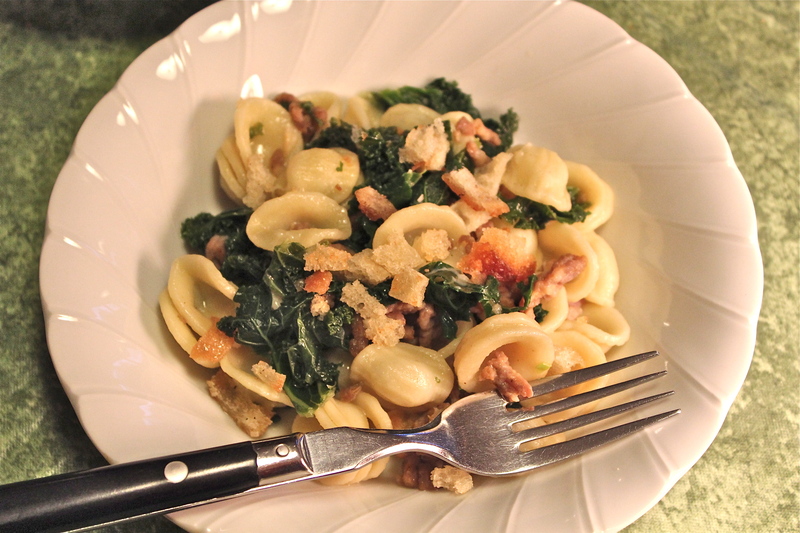 I’ve made a few adjustments to the original recipe which came from Rachael Ray on her daytime T.V. show. 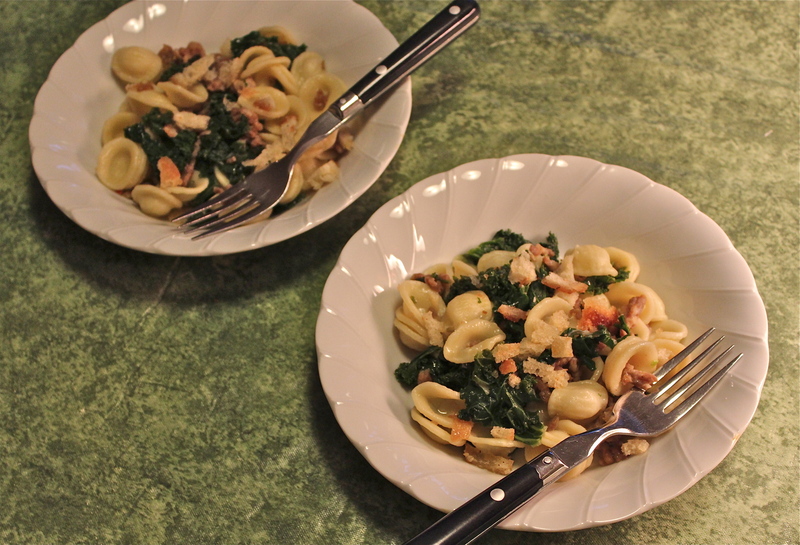 It goes together easily and can be made in less than an hour’s time. I’ve also made it in my slow cooker, by using less liquids, and it came out great. 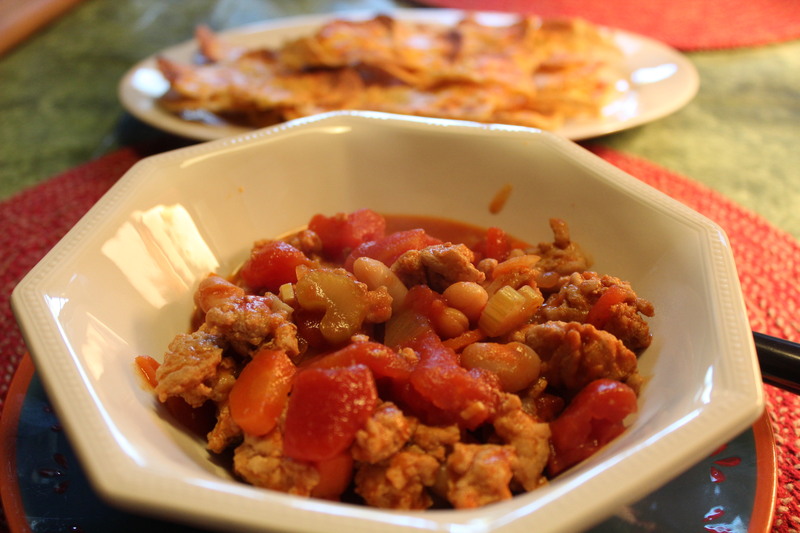 This is a variation on the traditional red chili, one I would call a white chili, even though it contains tomatoes. If you and your family like Buffalo wings, try this slightly different, mixed up version of the same flavors. 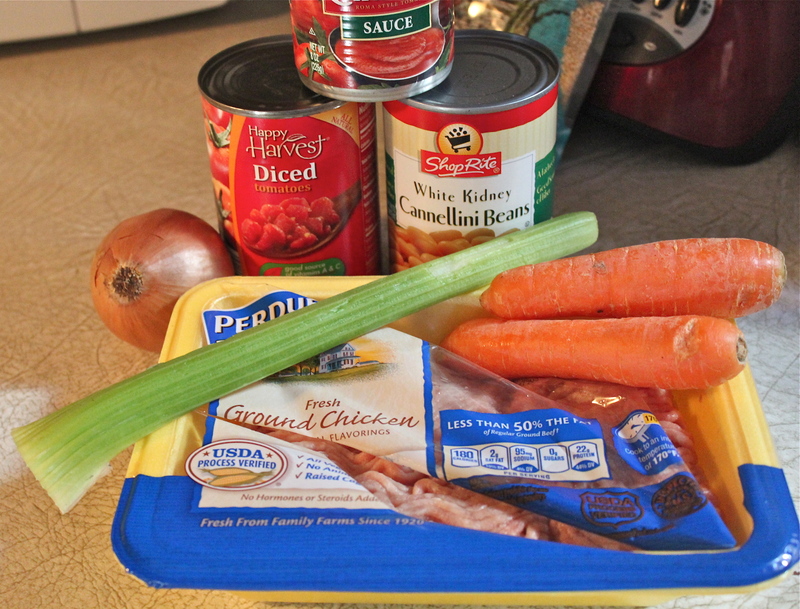 To make this into a low carbohydrate meal, you can omit the white beans. 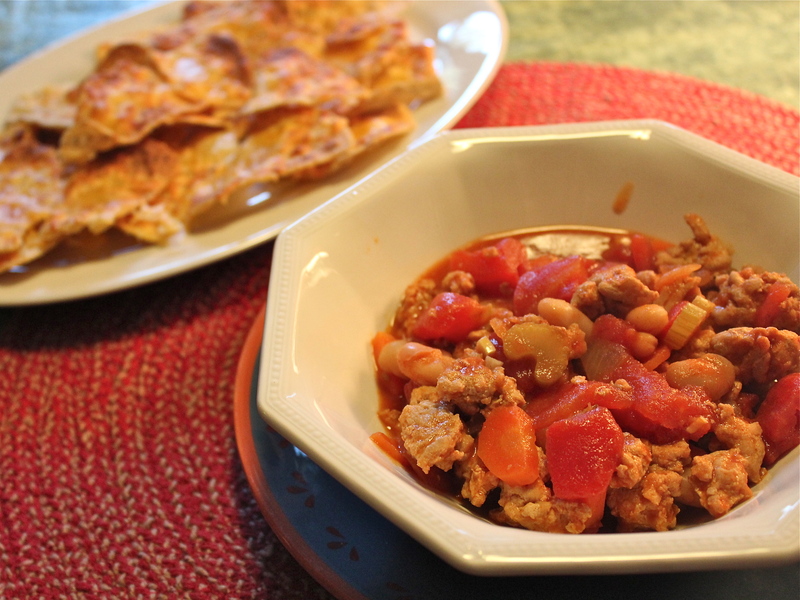 Whether you use the beans or not this chili is low-cal, it’s good and good for you. As Rachael would say, It’s Yum-O! Just a few ingredients, you may already have on hand. 1. 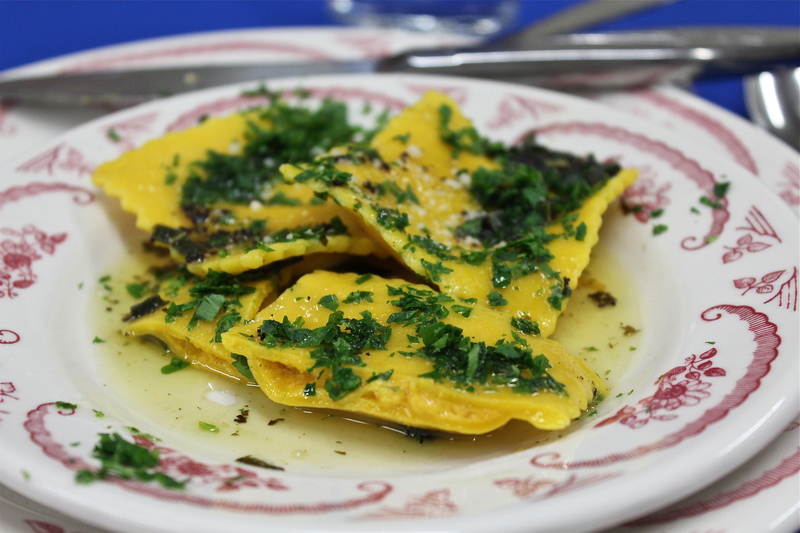 Place a large pot over medium-high heat with the EVOO, rotate the pan to spread the oil. 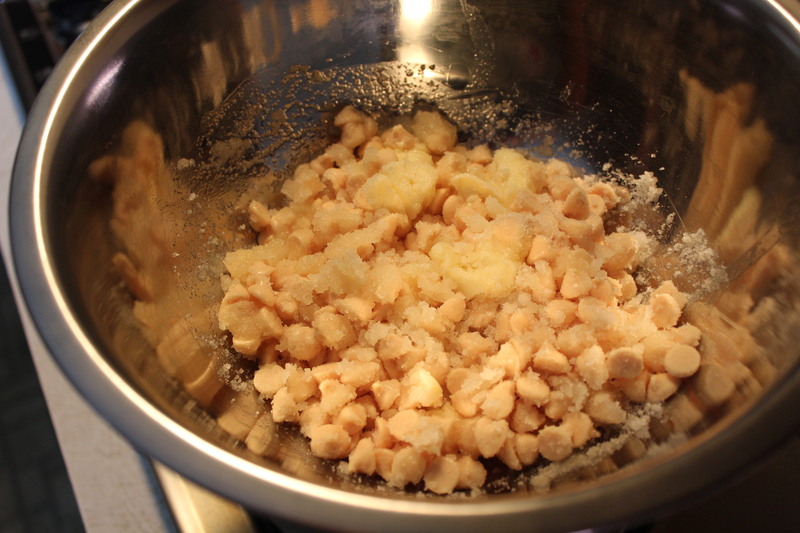 Add the ground chicken and break it up, lightly browning it for 5 minutes. 2. Add the carrots, onion, celery, garlic, paprika and bay leaf and season with salt and pepper. Cook, stirring frequently, for about 7-8 minutes. Add the chicken stock and scrape up any brown bits on the bottom of the pot. 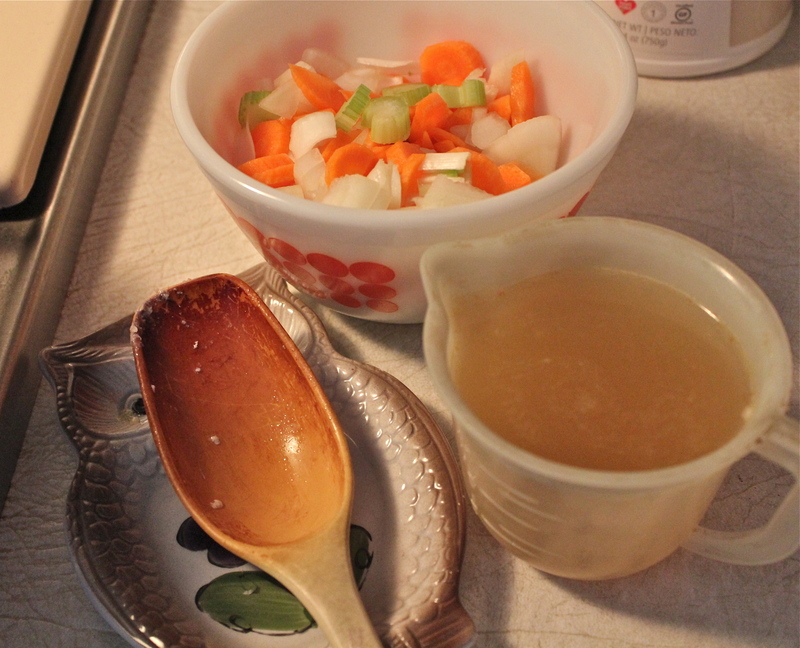 Chopped veggies and chicken stock waiting their turn in the pot. 3. 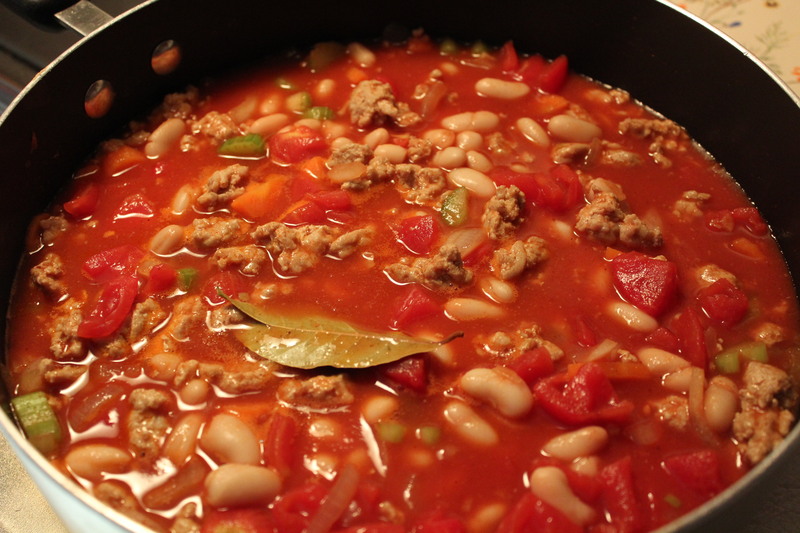 Add the hot sauce, tomato sauce, tomatoes, and white beans, (if using) to the chili and bring up to a bubble. Simmer for 8 – 10 minutes more to let the flavors come together. Tomatoes, sauce and beans added, plus seasonings. 4. While the chili is simmering, pre-heat the broiler. Spread the chips out on a cookie sheet. 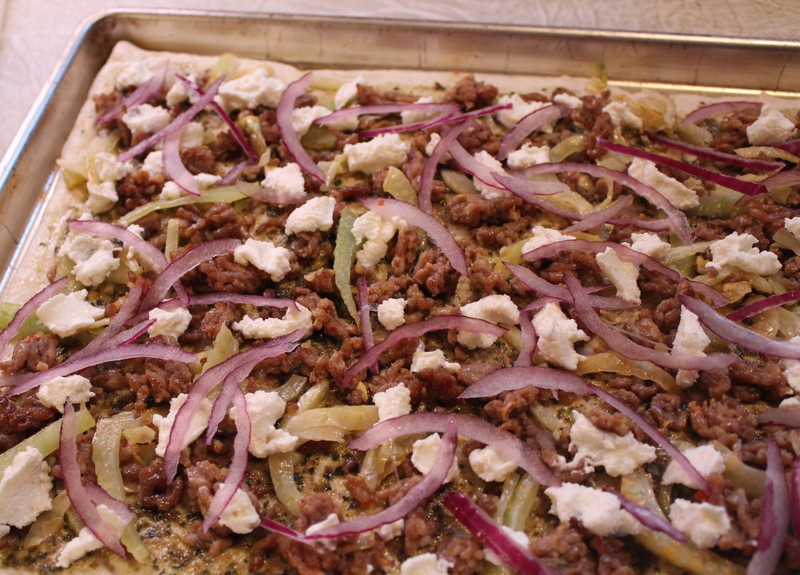 Top with the crumbled blue cheese and transfer to the oven to melt the cheese, 2 – 3 minutes. 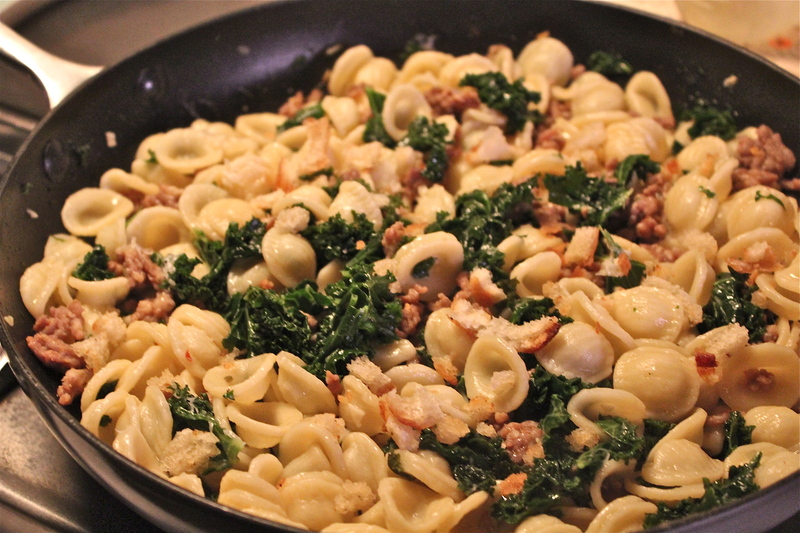 Remove from the oven and sprinkle with the chopped parsley. 5. 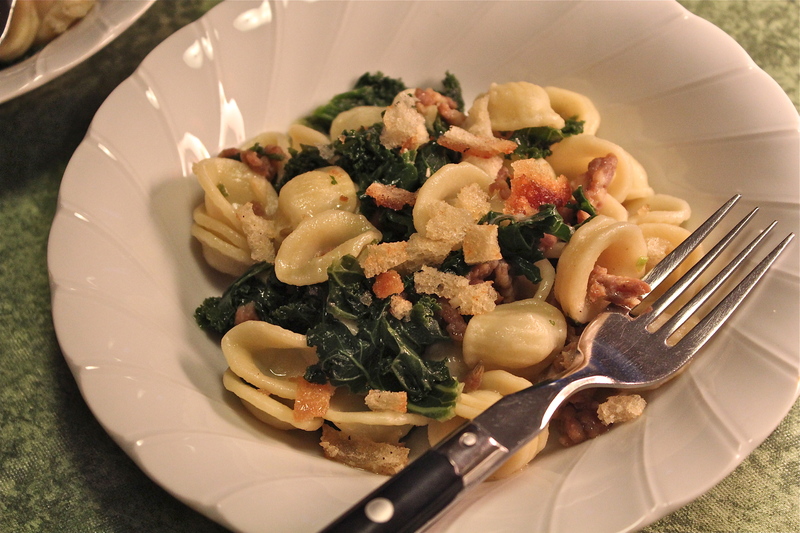 To serve, spoon into bowls and top each serving with a few blue cheese chips, or serve along side. 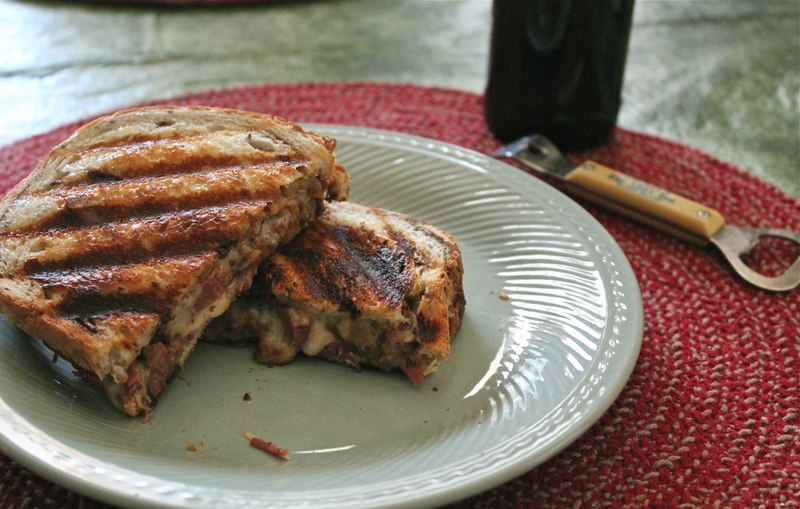 Grilled Corn Beef and Cheese Sandwich. 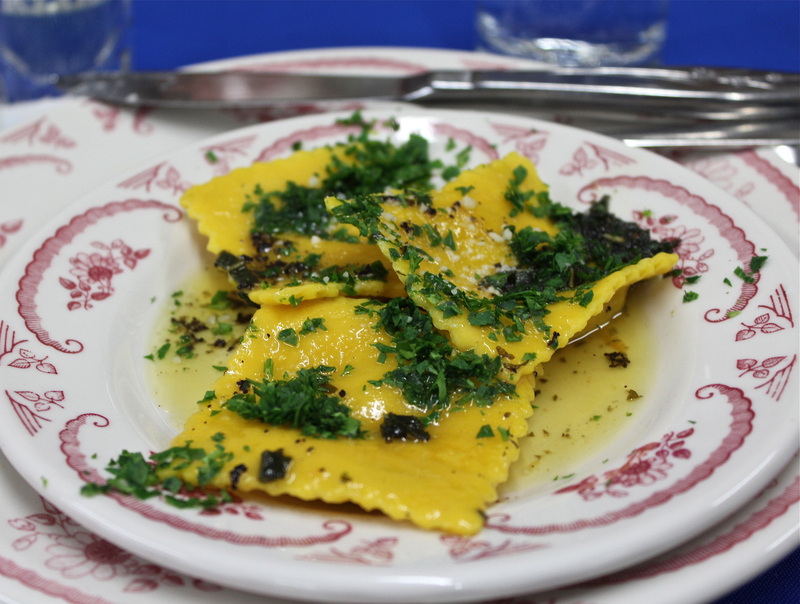 Did you know that everyday is some kind of National Food Holiday? And some days celebrate more than one kind of food. I don’t usually pay much attention to this sort of thing because some of them are just plain silly. For instance, you could get pretty tipsy if you celebrate National Mulled Wine Day, or bust a gut for National Nutella Day, or get really greasy fingers on National Fried Chicken Day. See what I mean? However there is one that I could get into in a big way. I really love grilled cheese sandwiches, and if there was a day to celebrate them, I would eat them all day. Well, SURPRISE! Grilled cheese is so highly regarded it has not just a day, but a whole month devoted to it, and this is it. April is National Grilled Cheese Month. Yea, I am totally in. 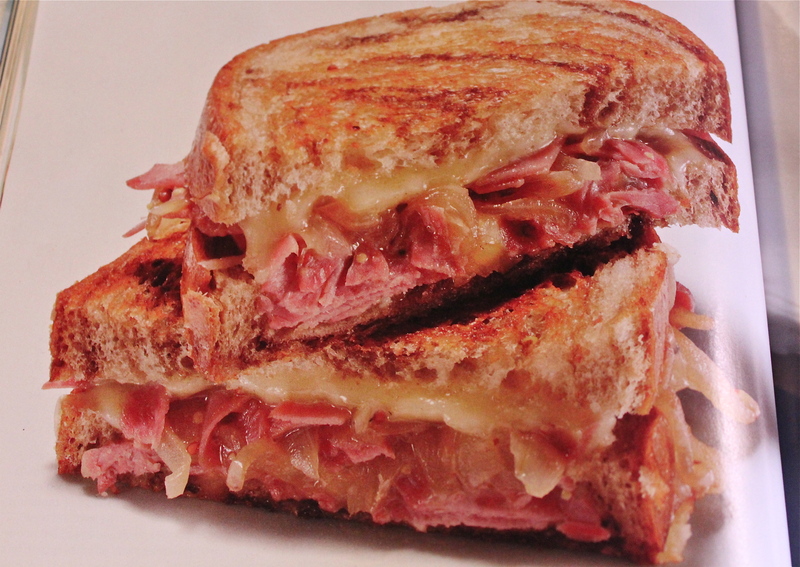 If you like corned beef and you love grilled cheese sandwiches, then you are gonna love this sandwich that combines both along with some glazed onions cooked in dark beer. WOW! what a combination. 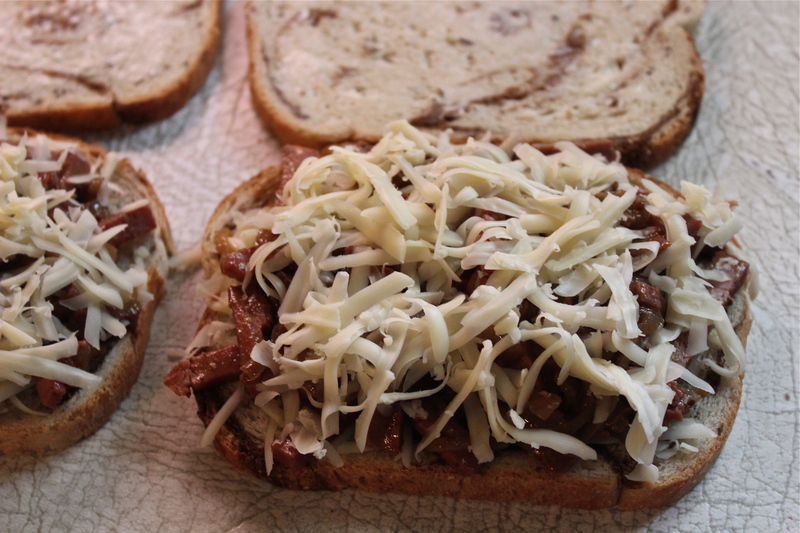 With some corned beef left from our Irish meal, I made these sandwiches for a weekend lunch. 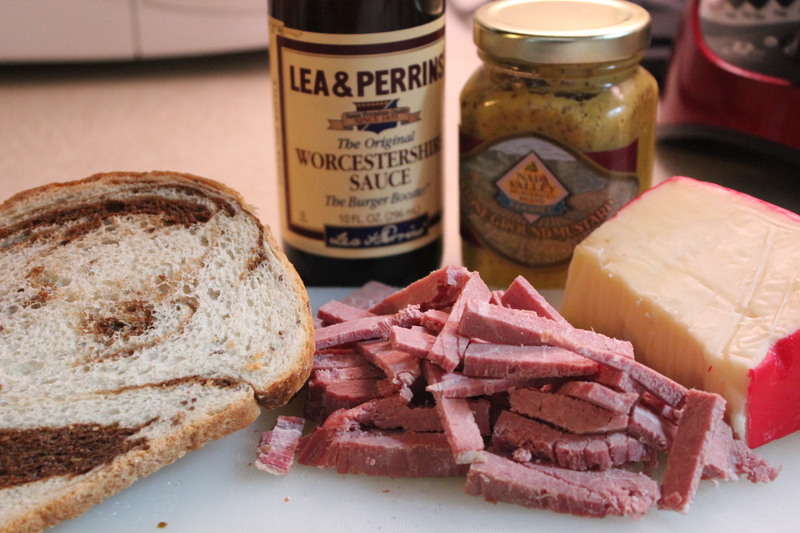 You can make the sandwich anytime using corned beef from the deli, but I used what I had on hand. You start by slowly cooking sliced onion in a little butter with some sugar, salt and pepper, then add dark beer such as porter or stout. Let that cook slowly to condense it into a syrupy liquid. 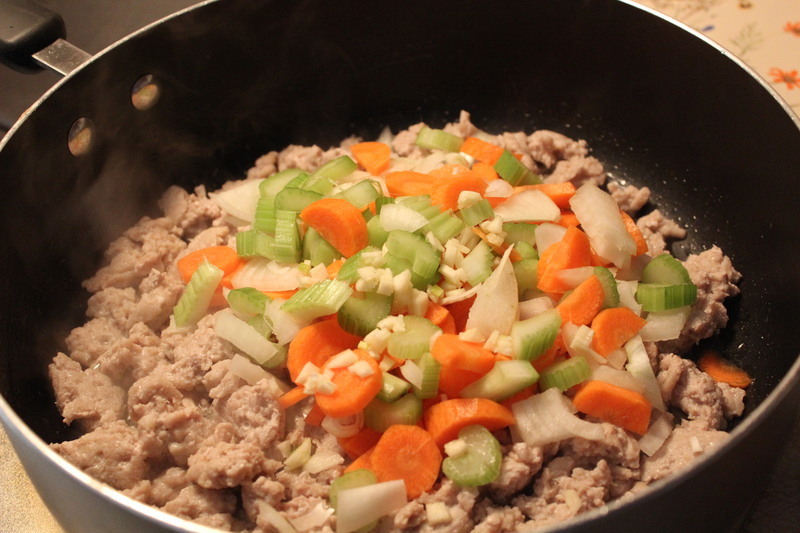 Add the corned beef and heat it up. Then layer up the sandwich, and grill it. 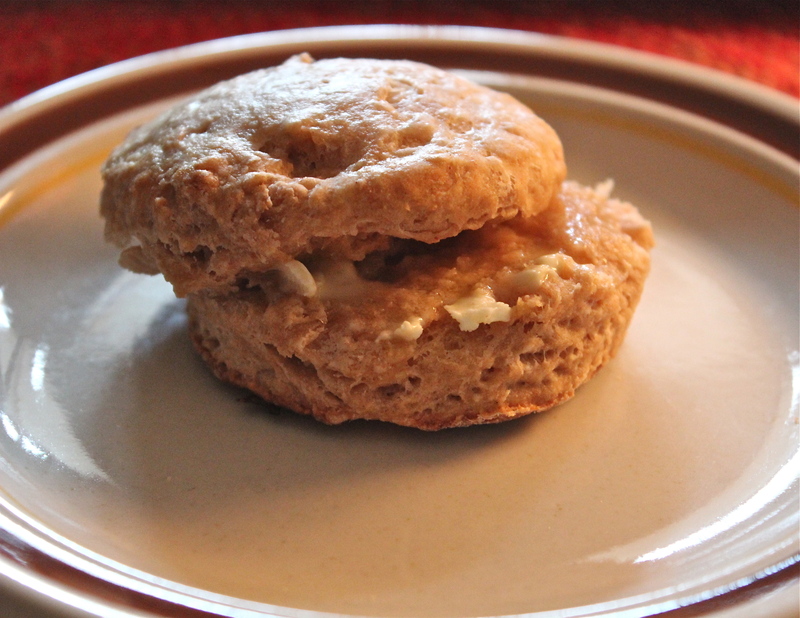 Rich, gooey, filling and soooo good. Worcestershire sauce and whole grain mustard contribute their flavors, too. 1. 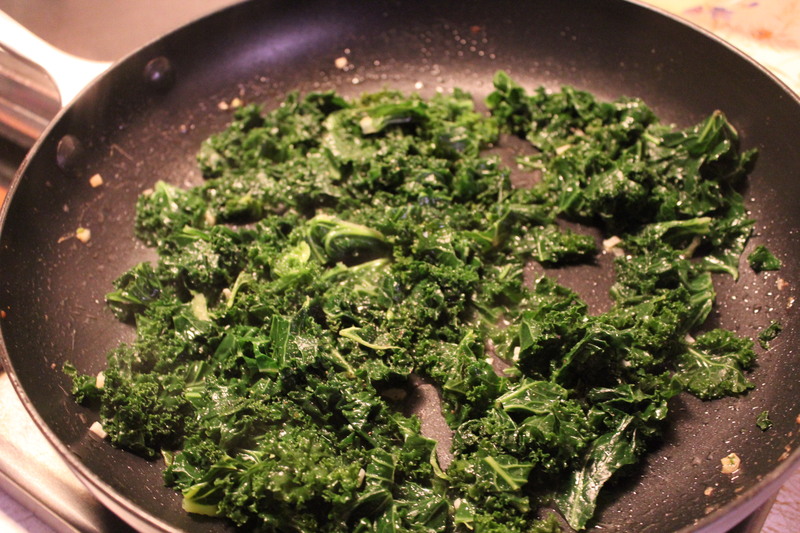 Melt 1/2 Tablespoon butter in a large skillet over medium-high heat. Add the onion and sprinkle with the sugar, 1/2 teaspoon salt and pepper to taste. Cook, stirring occasionally, until soft and golden, about 10 minutes. Cooking the onions with seasonings. 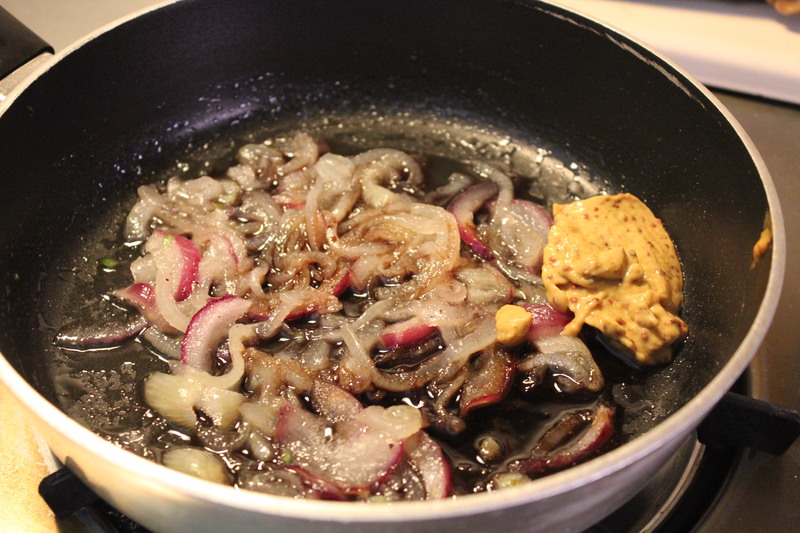 Add the Worcestershire sauce, mustard, and beer and continue cooking, stirring occasionally, until the onions are tender and the liquid is slightly syrupy, about 8 more minutes. 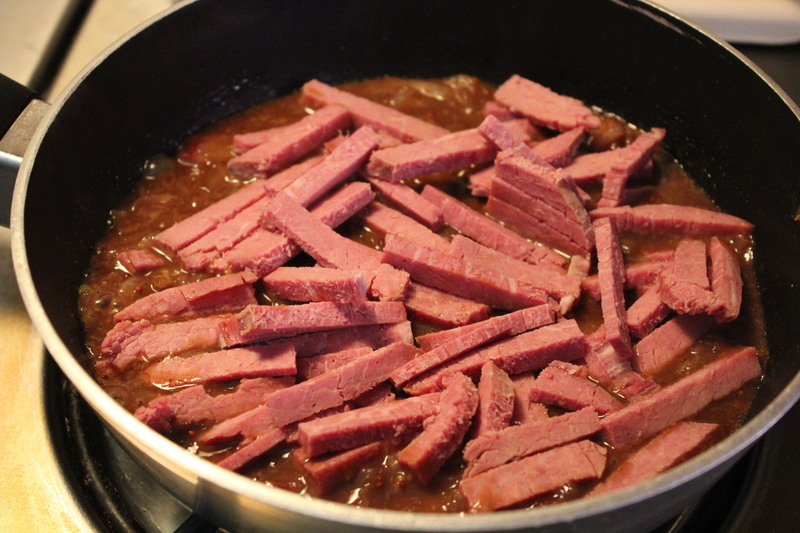 Remove from heat and stir in the corned beef. Corned beef added into the pan. 2. Divide half the cheese between 2 bread slices; top with the corned beef mixture, and the remaining cheese and 2 bread slices. Layer up the ingredients on the rye bread. *** I used my panini pan to grill the sandwiches, and instead of using butter to toast them, I spread mayonnaise on the outer sides of the bread. This makes a nice golden toasted sandwich. I read somewhere that chefs in restaurants use mayonnaise for grilled sandwiches, so now I do it, too. Don’t let the remainder of that beer go to waste, enjoy it with your sandwich. Today marks the beginning of my second year writing this blog, and I wanted to share with you something fabulous. I think this recipe is certainly that. Rich, indulgent and just plain delicious! 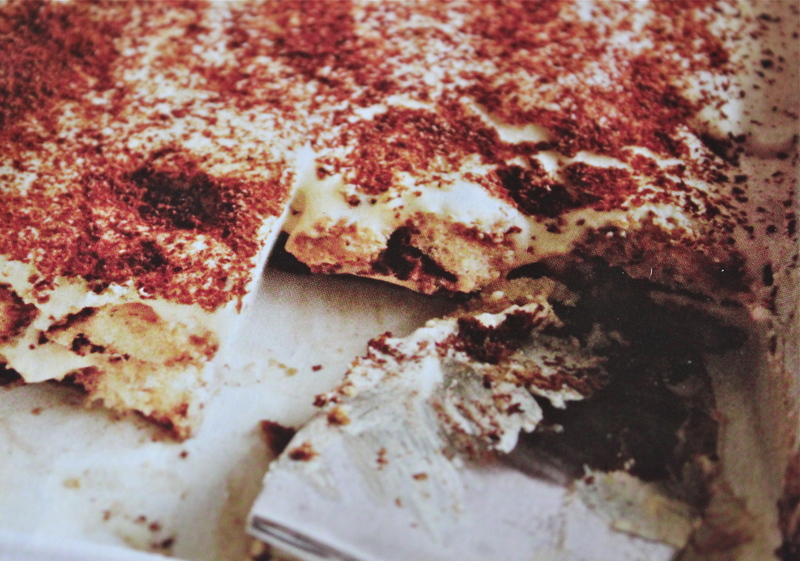 Tiramisu, with less calories and fat but still rich and delicious. 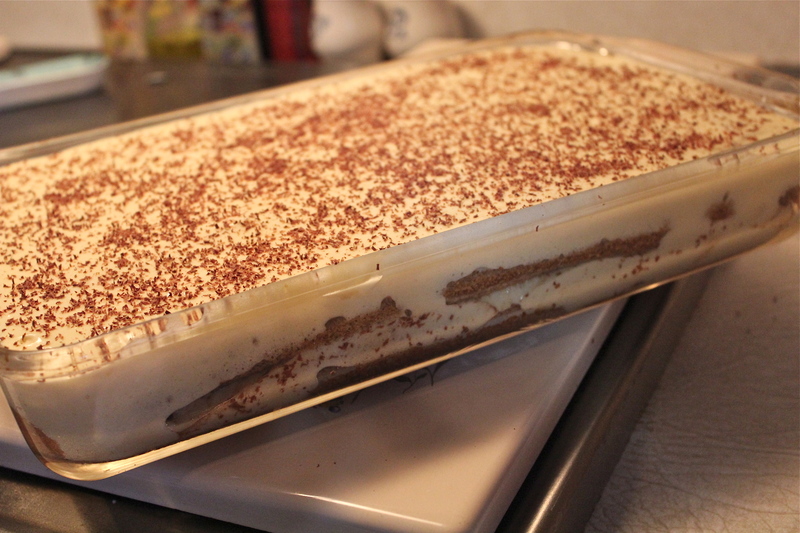 Most likely you have had tiramisu at one time or another. You know, the elegant, espresso-soaked sponge cake dessert, which is characterized by its rich layers of buttery mascarpone cheese and sweetened whipped cream, topped off with shaved chocolate. 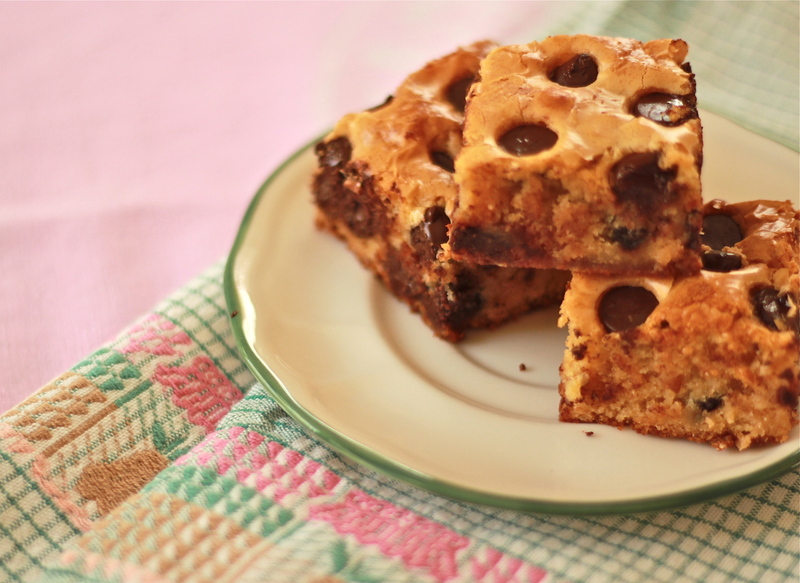 If you have never had it, then I suggest you try this lightened up version for a treat that still delivers the flavor of the original without all the fat and calories. 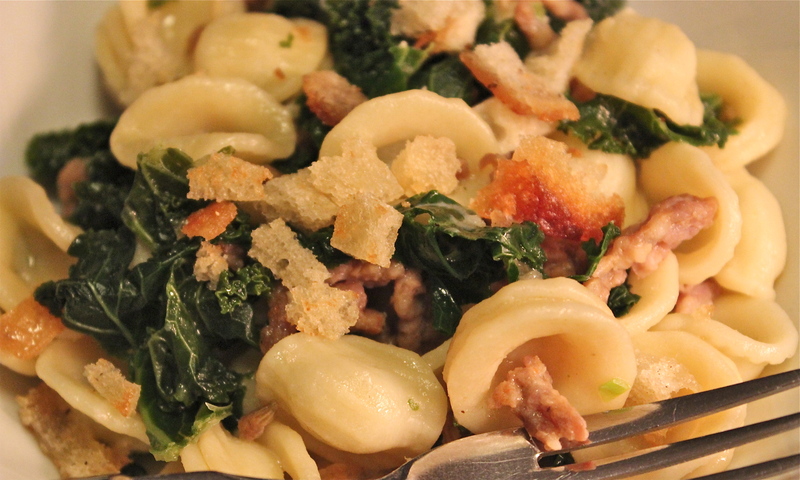 The classic recipe packs a wallop; a day’s worth of fat and almost 600 calories. Mascarpone is Italy’s version of a dessert butter; delicious to be sure, but you don’t need so much to make a dessert which is still rich tasting. To lighten it , this recipe subs in 1/3 less fat cream cheese, with still a bit of mascarpone for richness, and mixes it into a lightly sweetened egg custard. 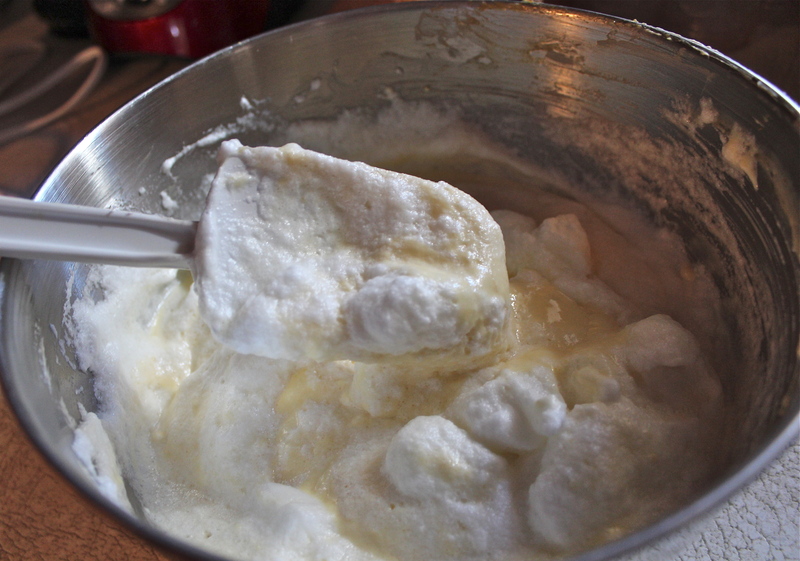 Egg whites are whipped, then folded into the custard, eliminating the need for whipped cream. 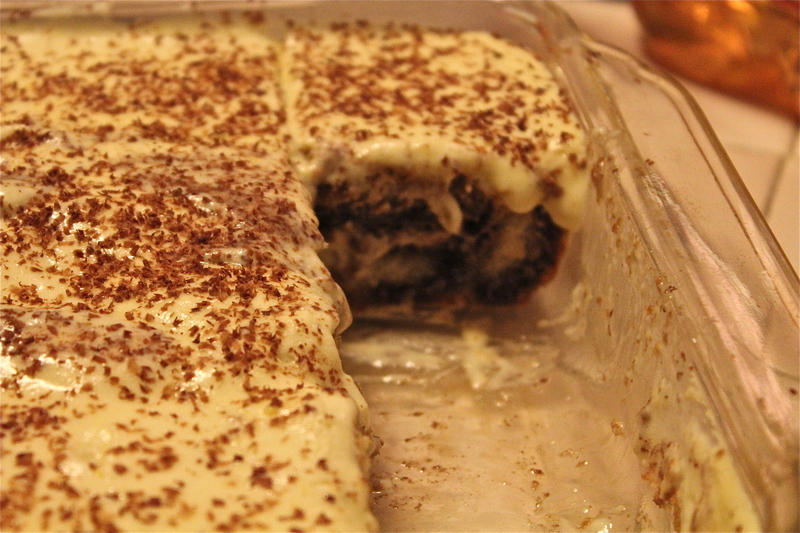 Crisp lady-fingers get dipped into Kahlua-spiked coffee and are then layered with the creamy custard-like filling. 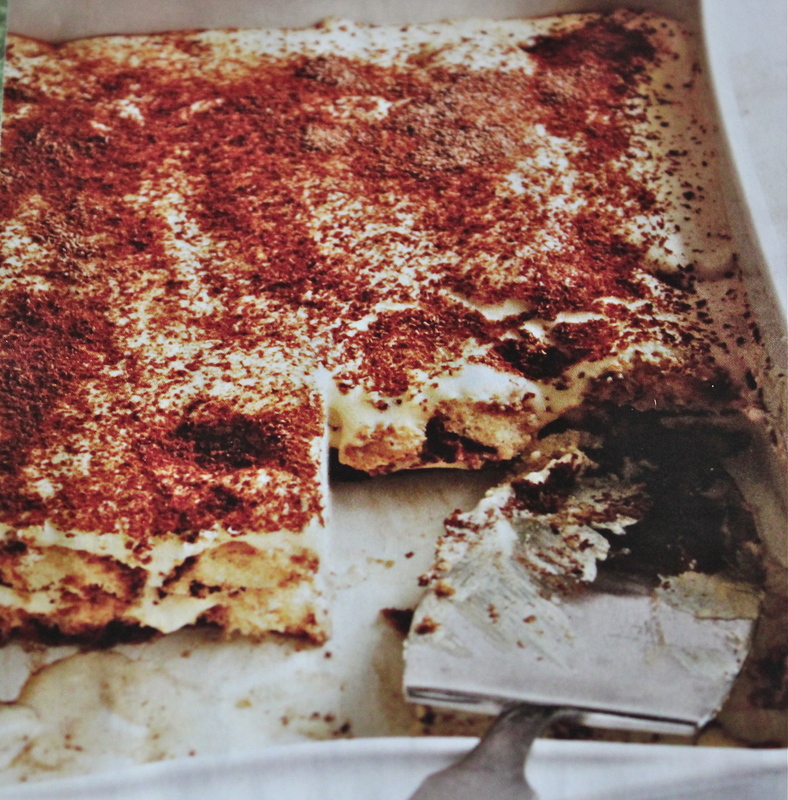 A dusting of bittersweet chocolate adds one more layer of flavor for an indulgent treat that will truly be a pick-me-up, for that’s what “tiramisu” means. Two layers of sweet, creamy indulgence. We were guests at my sister-in-law’s home for Easter dinner, and this is what I brought for dessert. Everyone thought it was divine. I needn’t have worried that they would detect it wasn’t the original version. It disappeared so fast no one even questioned it. 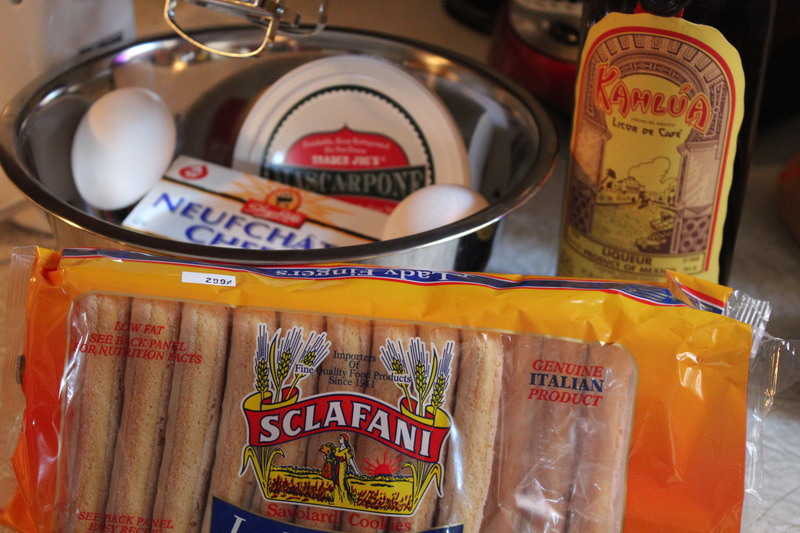 Ladyfingers, 2 kinds of cheese, Kahlua, and eggs. 1. Bring 1 1/2 cups water to a boil, and remove from heat. Add coffee; cover and let stand for 10 minutes. 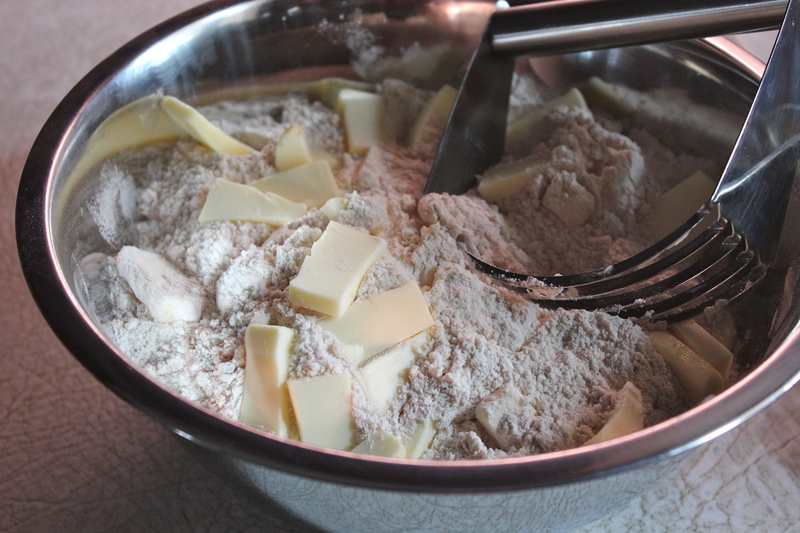 Strain through a cheesecloth-lined sieve into a medium bowl; discard grounds. Cover and refrigerate until needed. 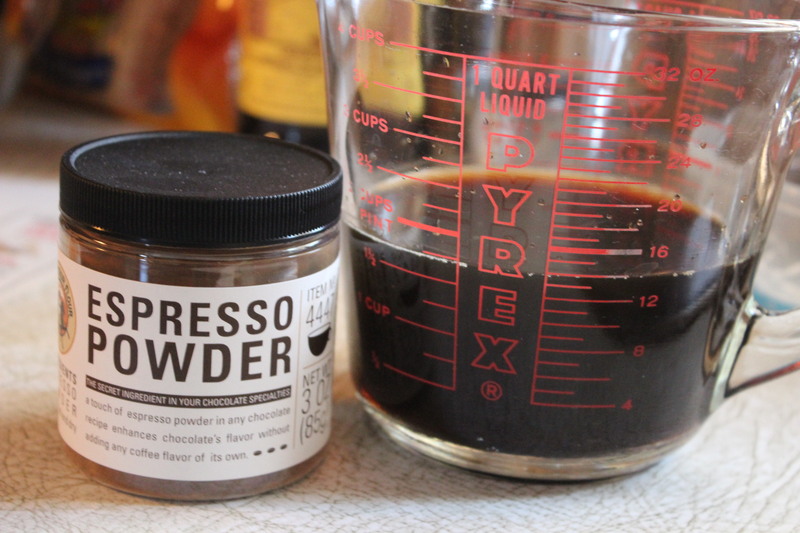 I brewed extra coffee in the morning, then into 1 1/2 cups coffee I added 1 Tablespoon espresso powder; heated up the mixture to dissolve the espresso, then chilled it. Espresso mixed with brewed coffee for a strong coffee flavor. 2. 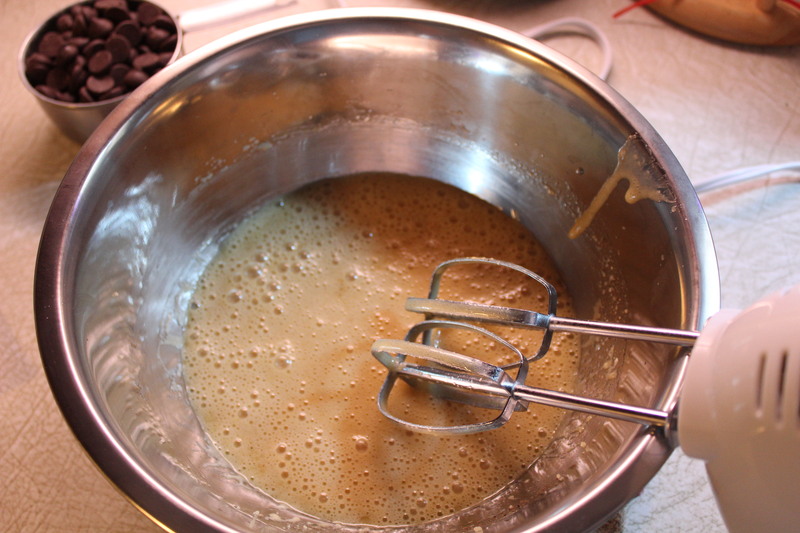 Combine 1/4 cup sugar, egg yolks, and 1 Tablespoon Kahlua in the top of a double boiler, stirring well with a whisk. 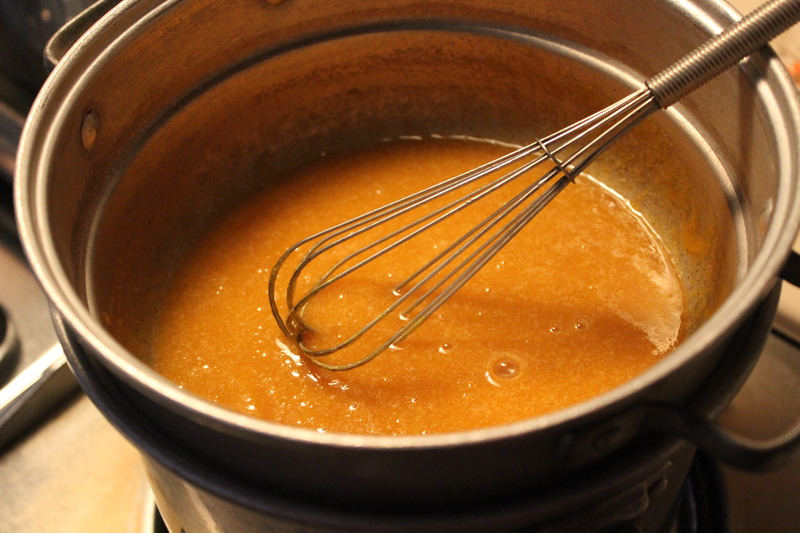 Cook over simmering water, whisking constantly, until thick and candy thermometer registers 160* (about 9 minutes). 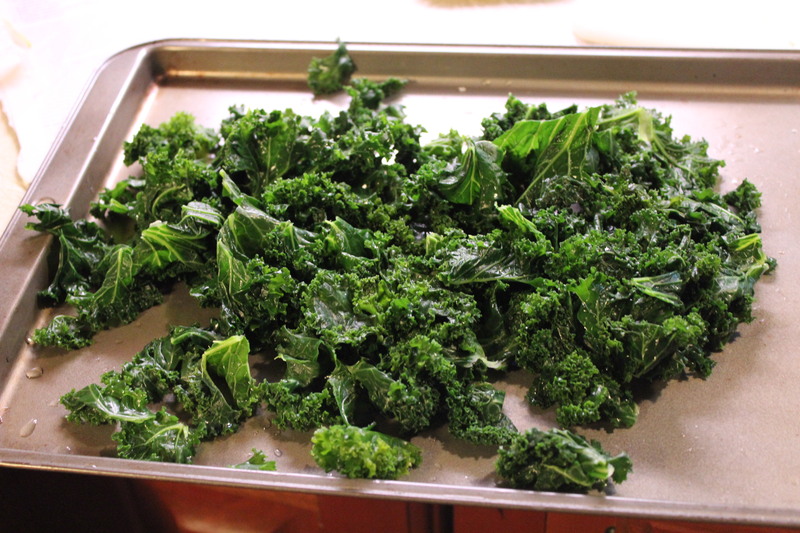 Remove from heat; refrigerate 10 minutes. Cooking the egg yolks with sugar and Kaluha. 4. 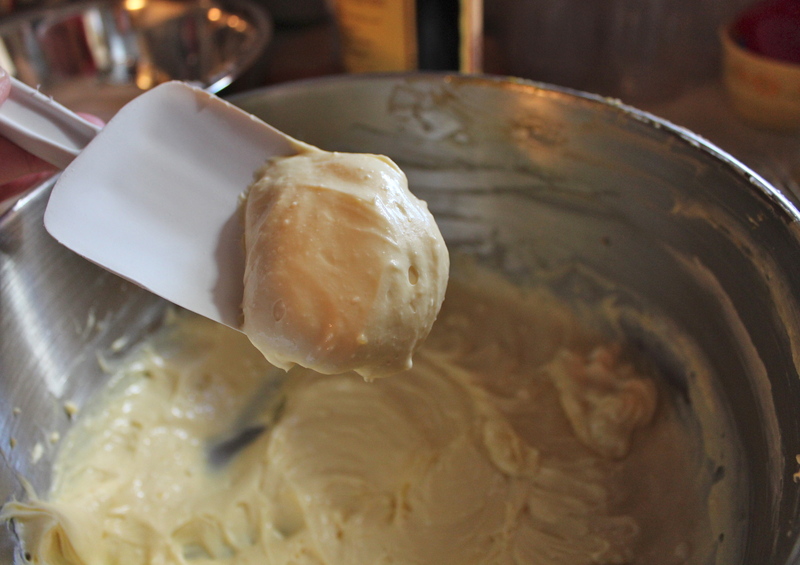 Combine egg yolk mixture, cream cheese, and mascarpone cheese in a large bowl, and beat with a mixer at medium speed until smooth. Egg yolk mixture beaten with cream cheese and mascarpone. 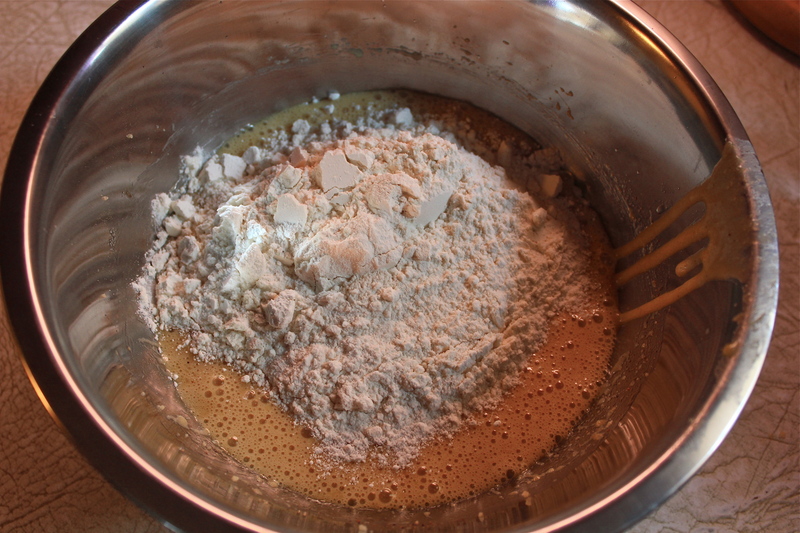 Gently stir one-fourth of egg white mixture into cream cheese mixture; gently fold remaining egg white mixture into cream cheese mixture. 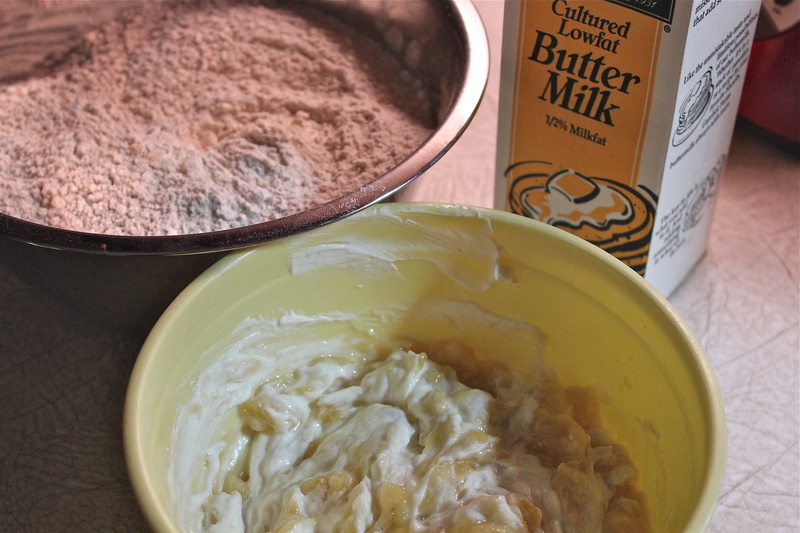 Fold egg whites into egg/ cheese mixture. 5. Add remaining 1 Tablespoon Kahlua to coffee. 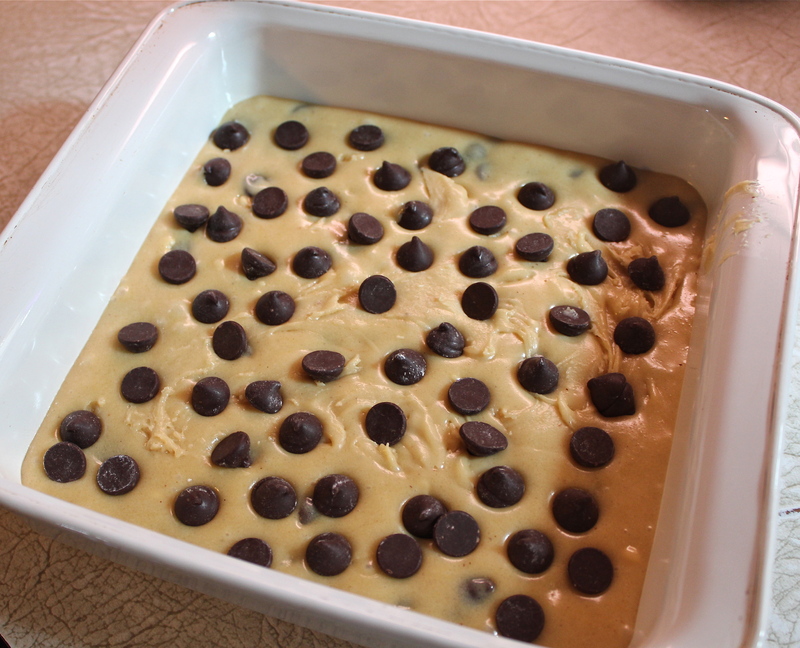 Quickly dip 12 ladyfingers into coffee mixture; arrange in the bottom of an 11 x 7-inch baking dish. 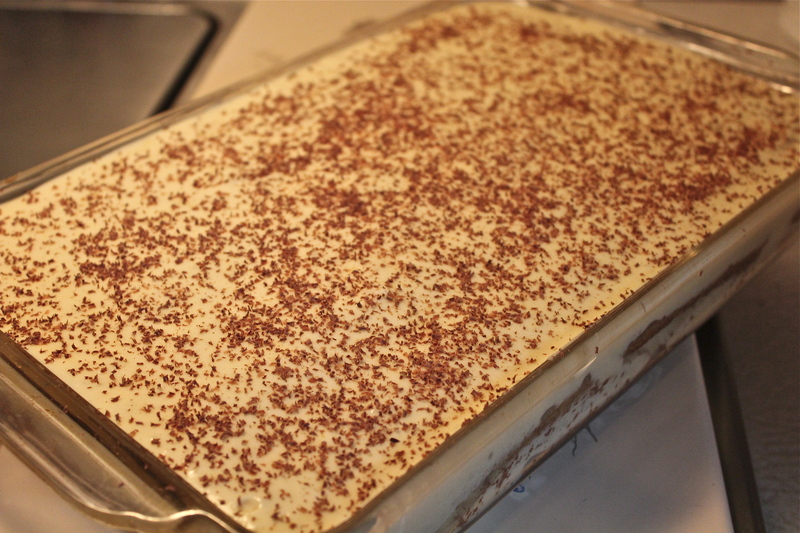 Note: I used an 8″ x 12″ pan and 15 ladyfingers, without changing anything else, and there was enough coffee and custard to cover adequately. 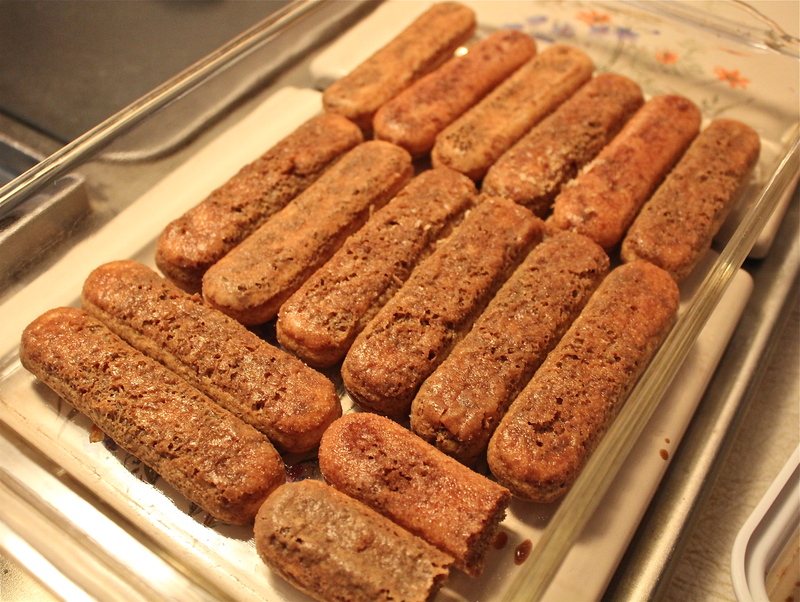 Ladyfingers dipped and placed into bottom of baking dish. 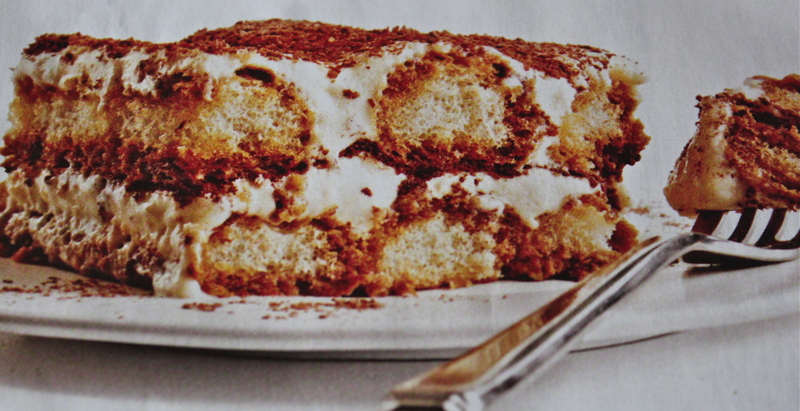 Spread half of cream cheese mixture over ladyfingers. 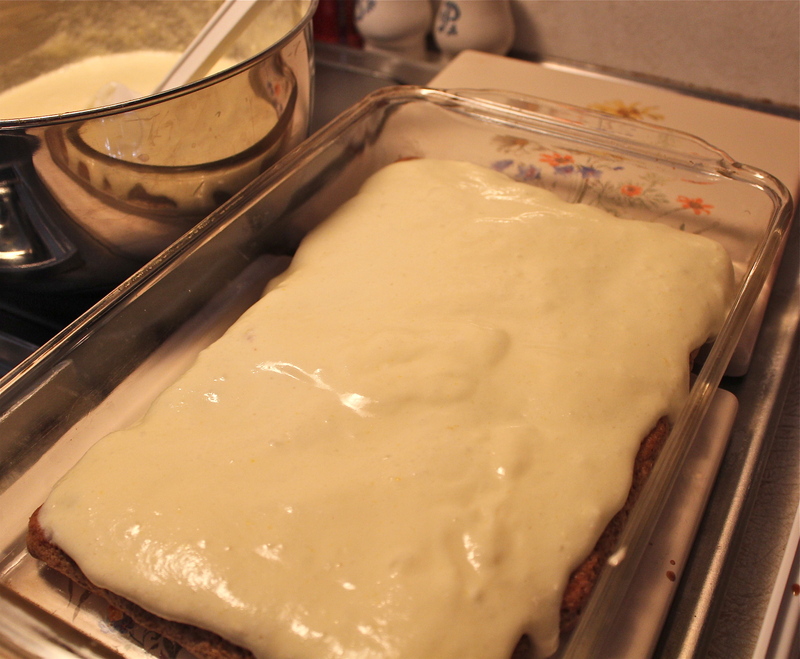 Spread with half the cream cheese mixture. Sprinkle with half of the chocolate. Sprinkle with half the chocolate. 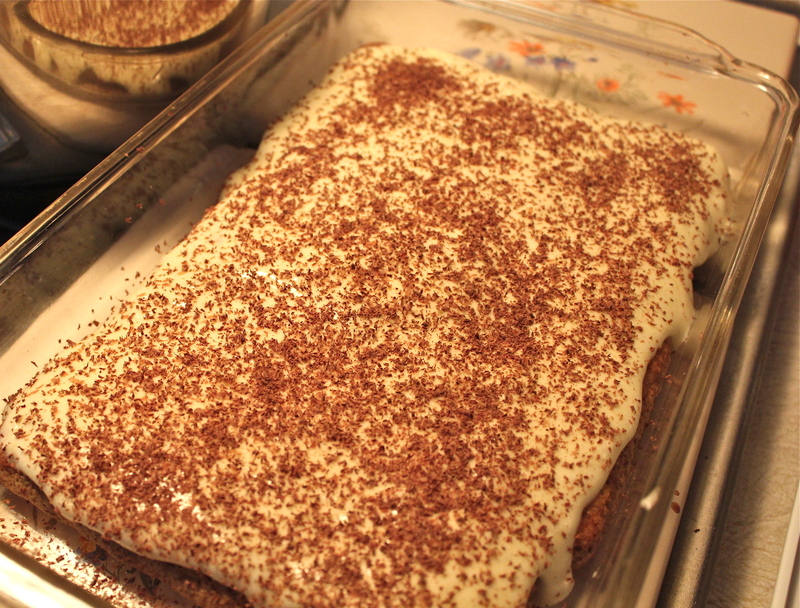 Repeat procedure with the remaining ladyfingers, coffee mixture, and cream cheese mixture . Sprinkle with remaining chocolate. Cover and chill at least 2 hours. This makes a full pan. 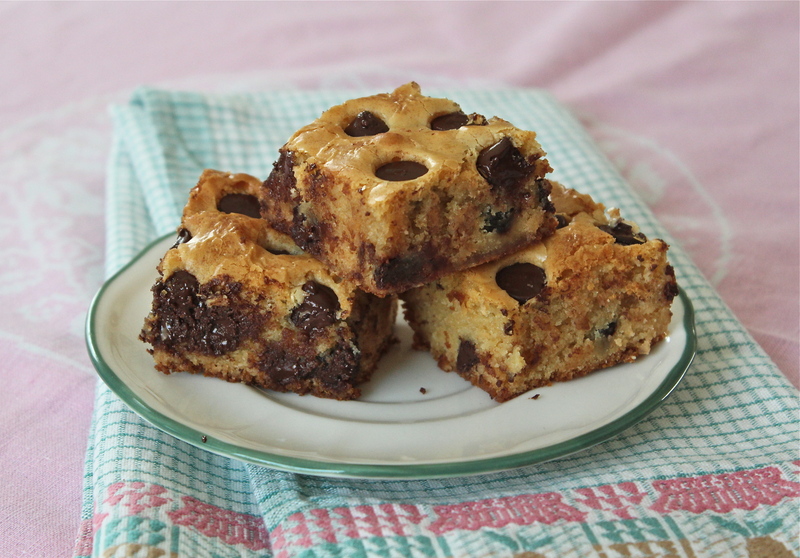 Cut into squares and remove with a spatula. Try it. I’m sure you will love it!